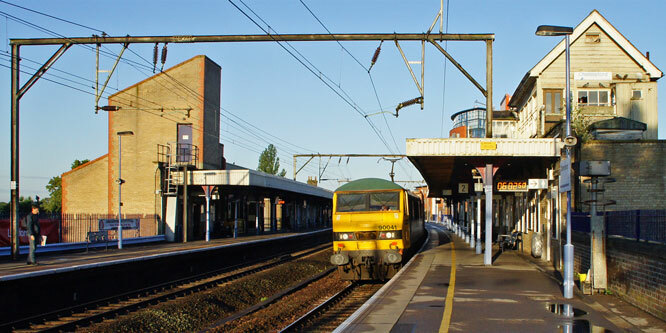 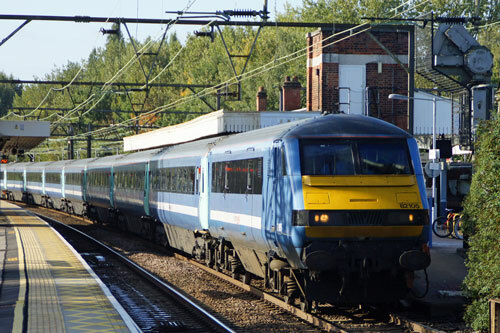 Greater Anglia is the train operating company (TOC) which provides local, suburban and express services from Liverpool Street in the City of London to destinations in the northern and eastern regions of Greater London and parts of the East of England. 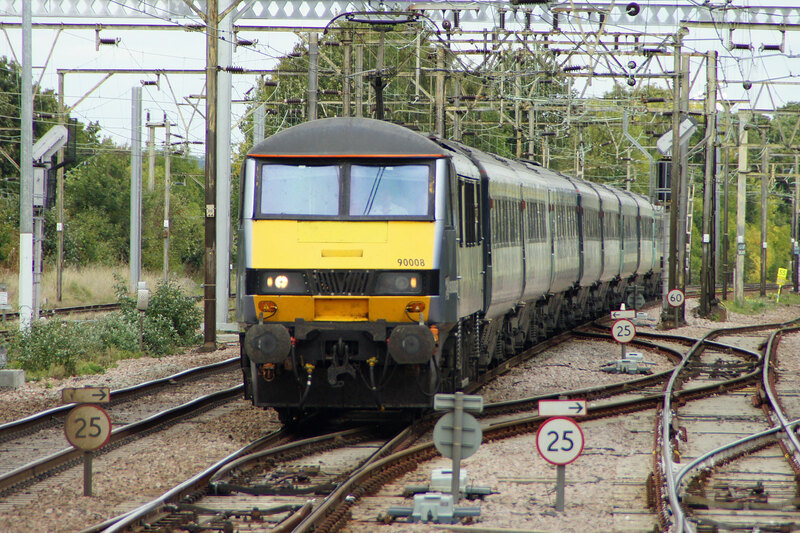 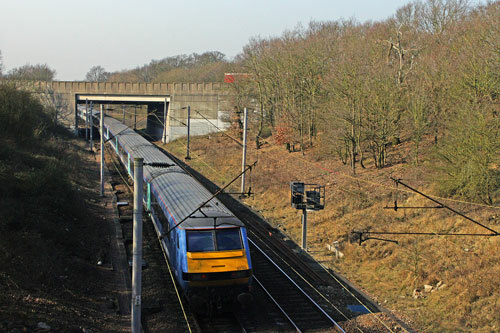 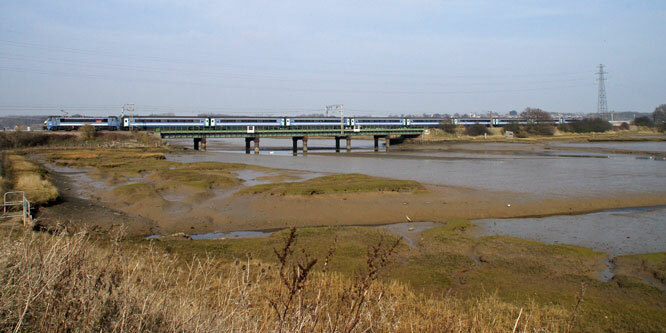 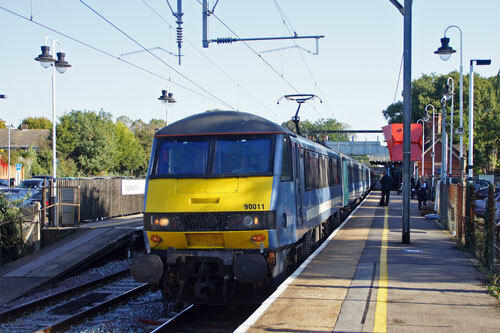 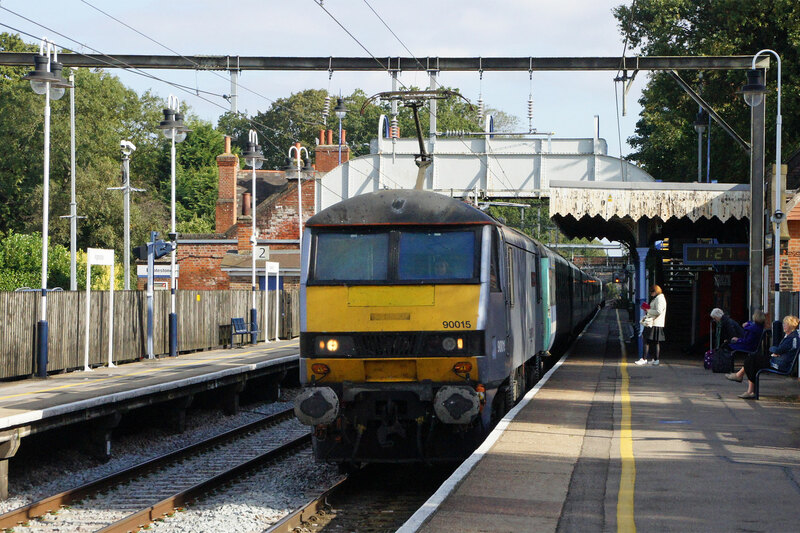 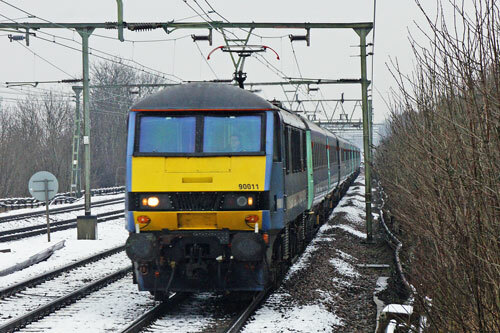 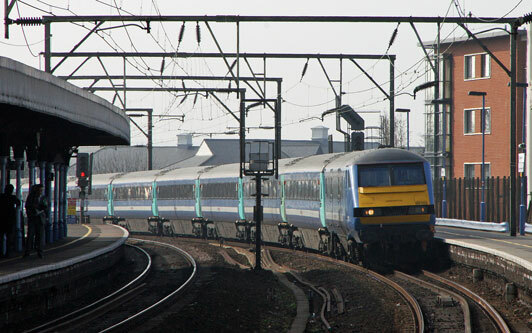 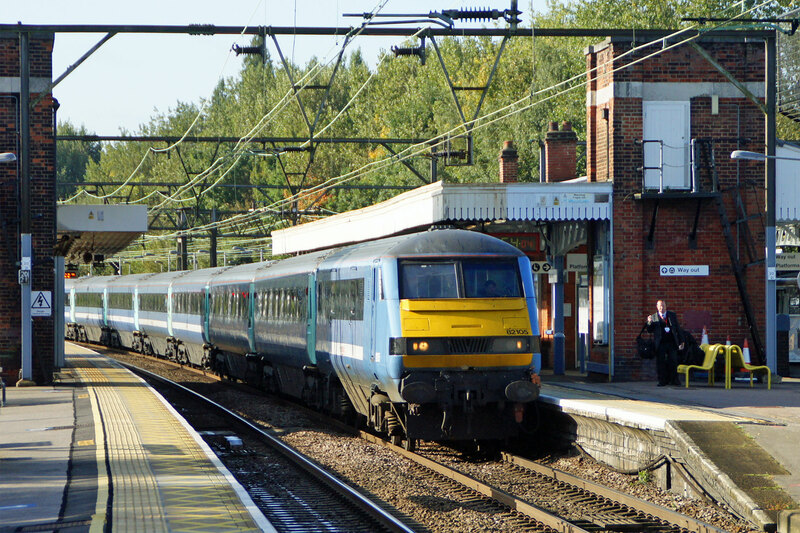 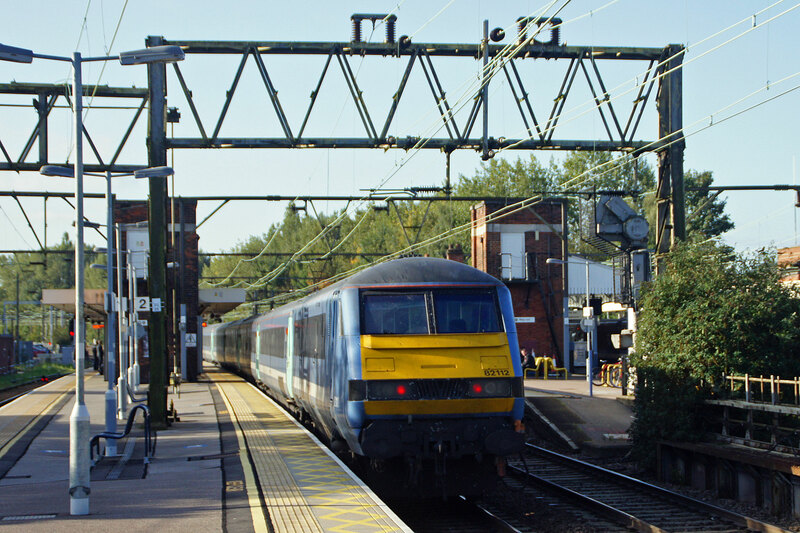 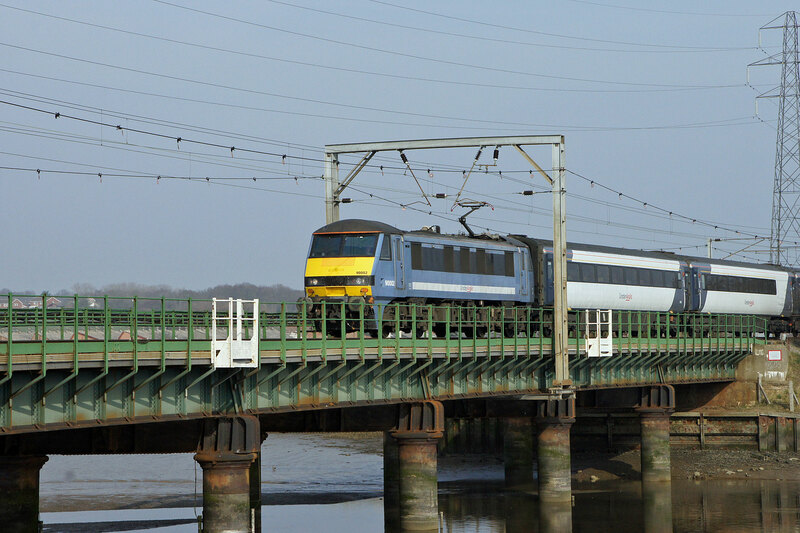 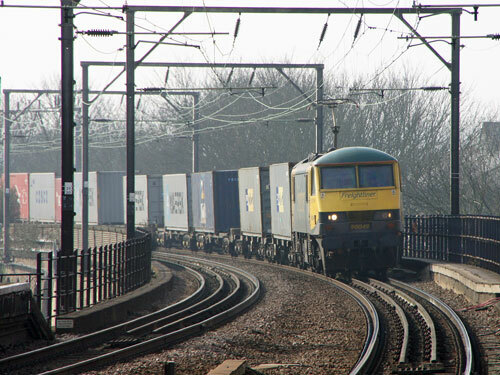 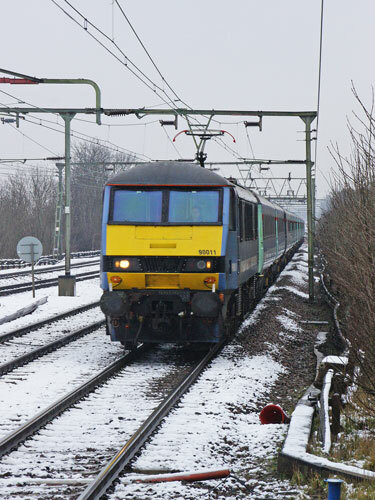 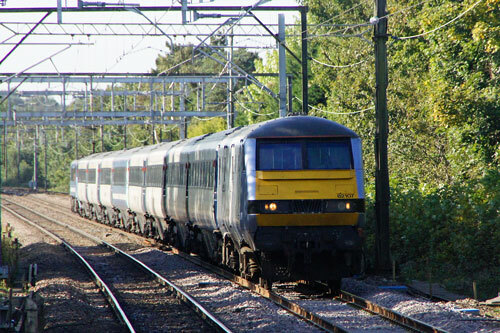 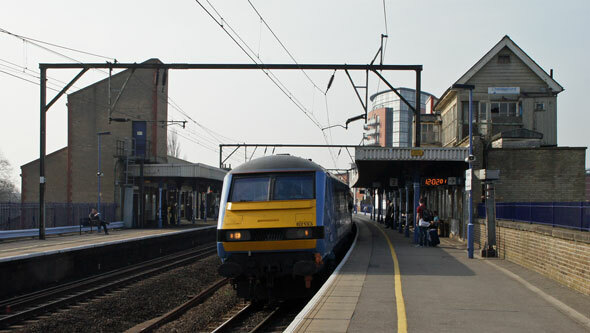 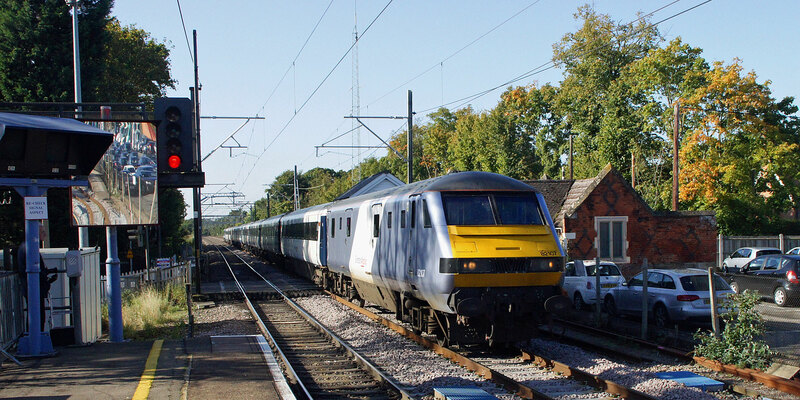 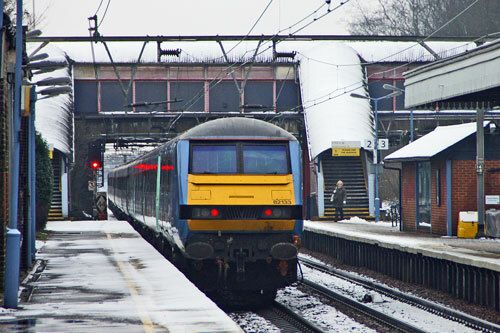 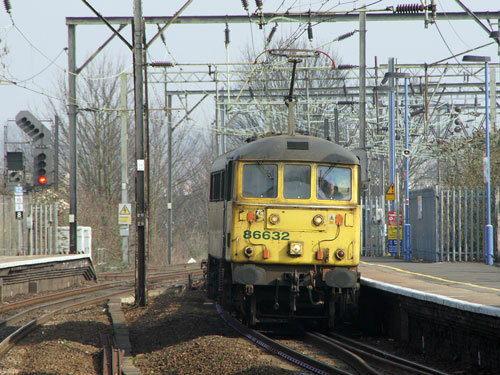 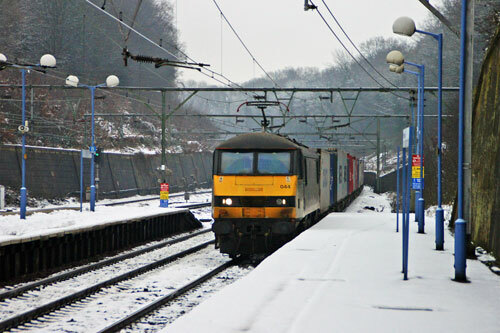 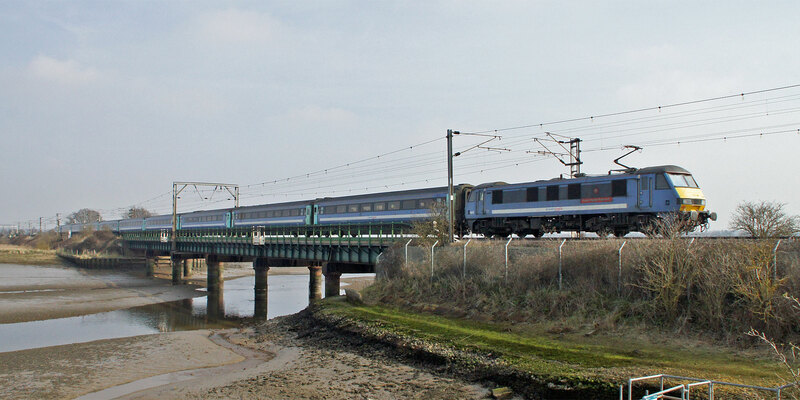 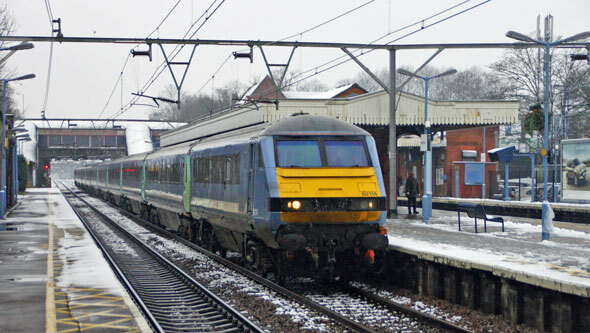 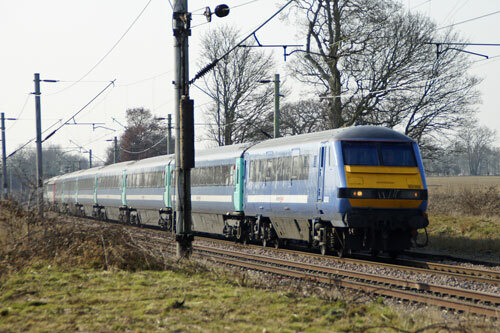 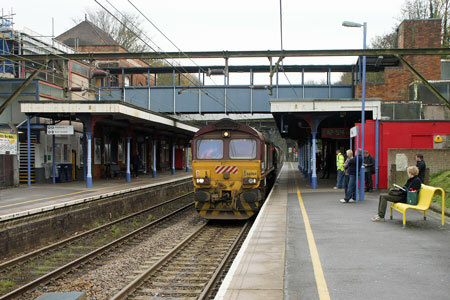 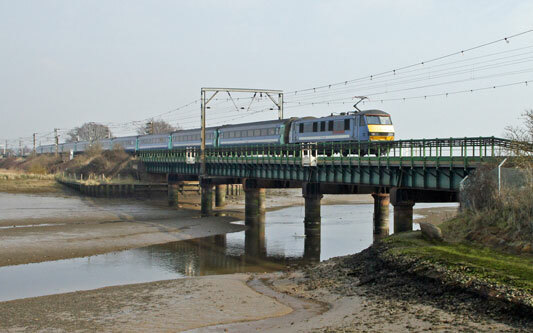 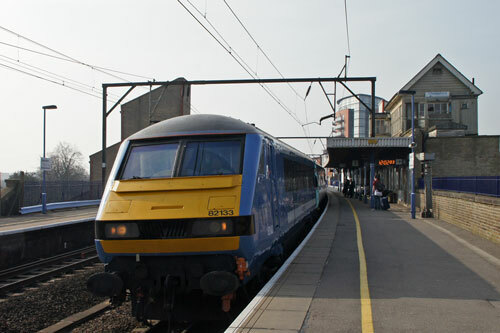 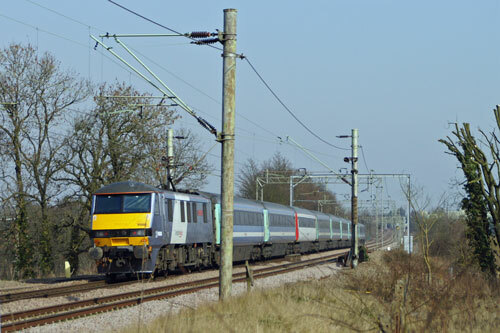 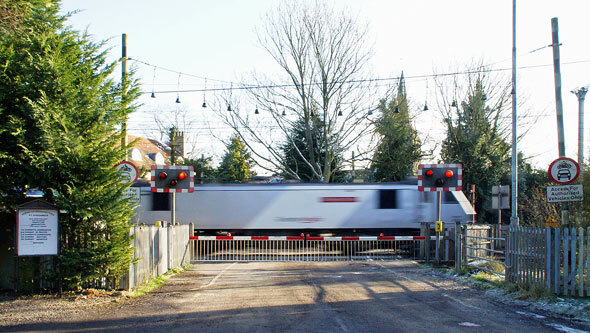 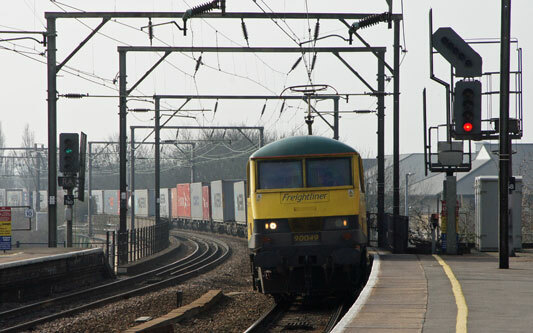 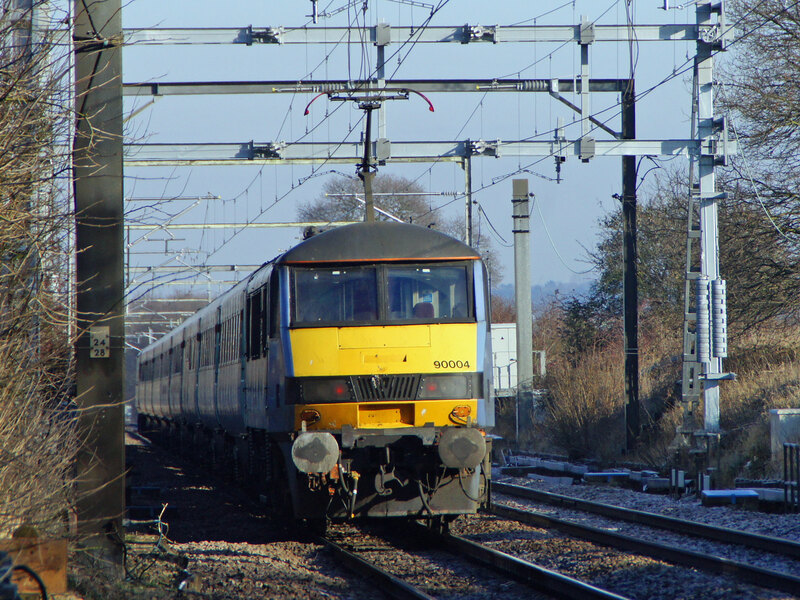 It succeeded National Express East Anglia (NXEA), ONE Railways and First Great Eastern as the operator of the Greater Anglia franchise from 5 February 2012. 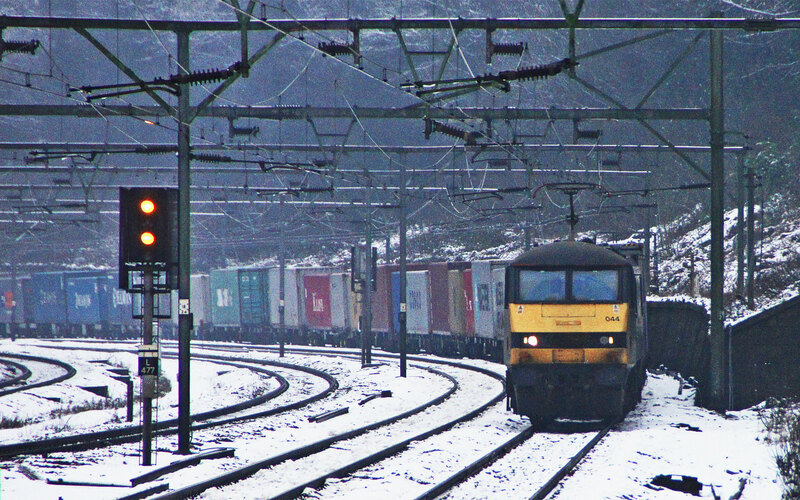 Its parent company is Nederlandse Spoorwegen's subsidiary Abellio. 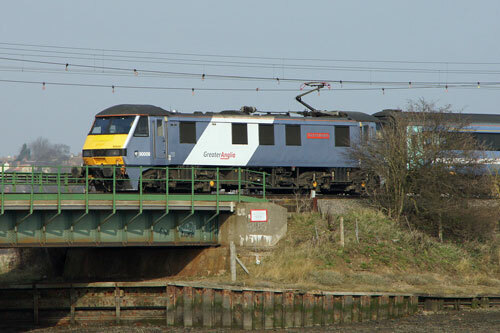 This page shows images of Greater Anglia services plus those of predecessors, NXEA, ONE and First Great Eastern. 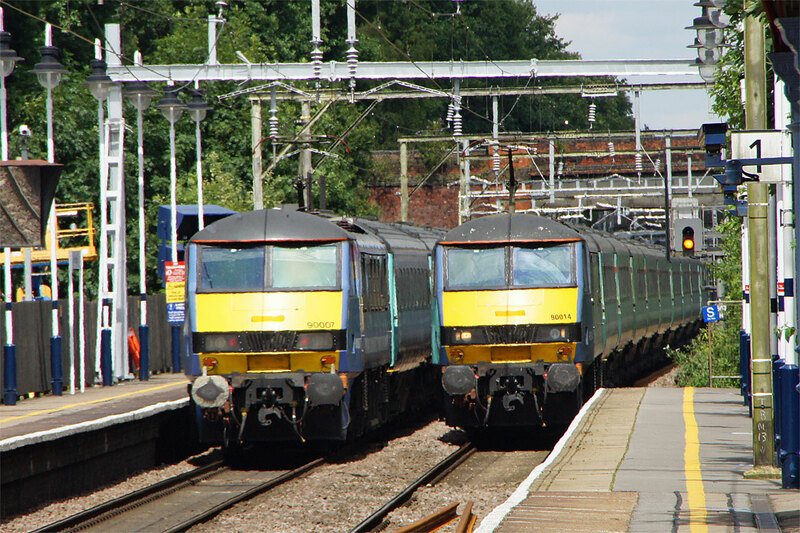 The liveries of all these earlier TOCs were still in use in early 2012. 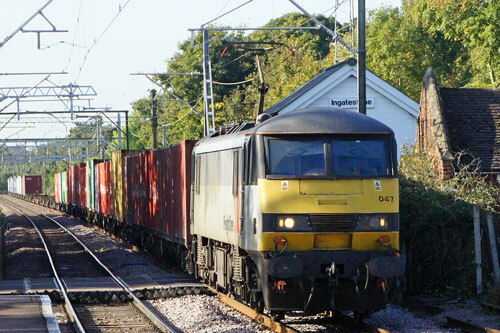 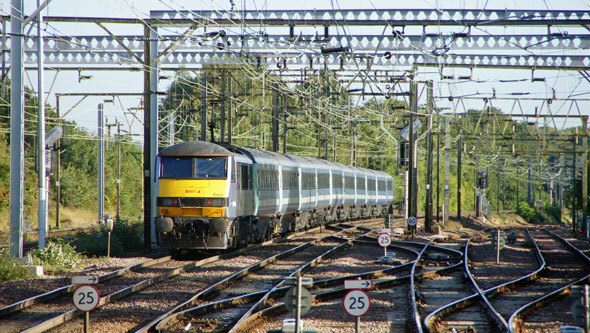 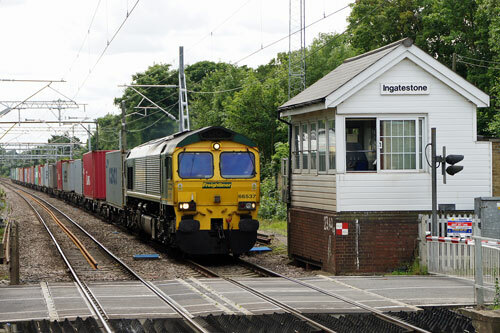 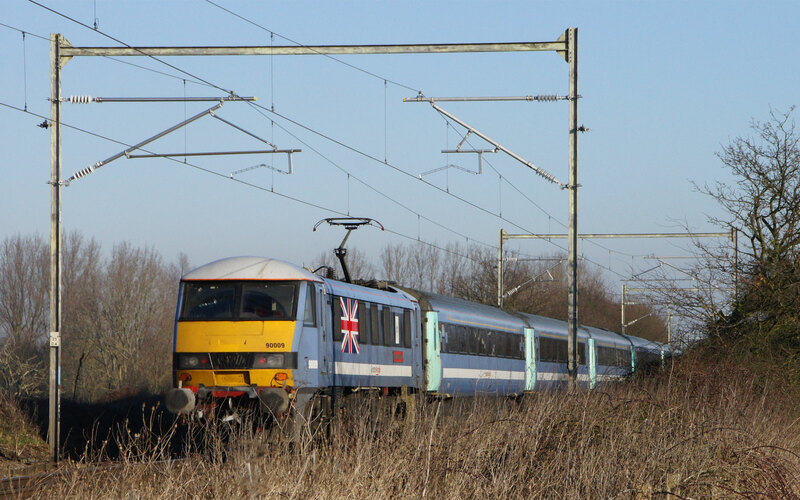 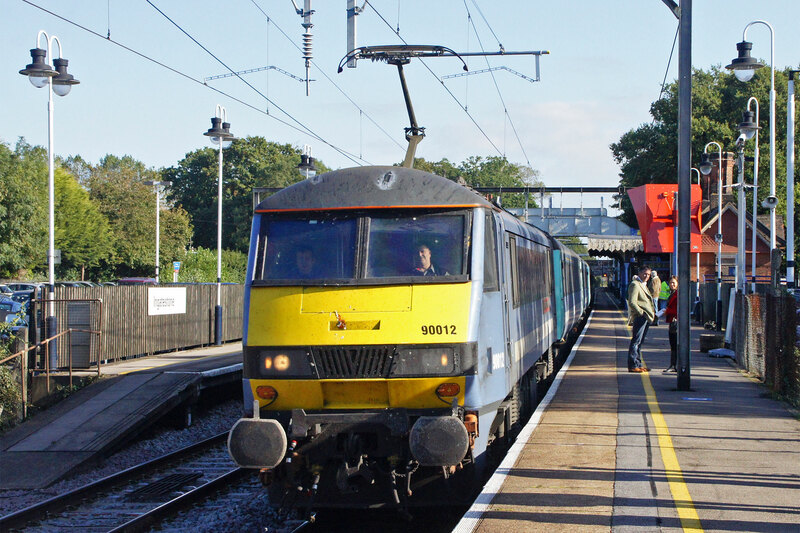 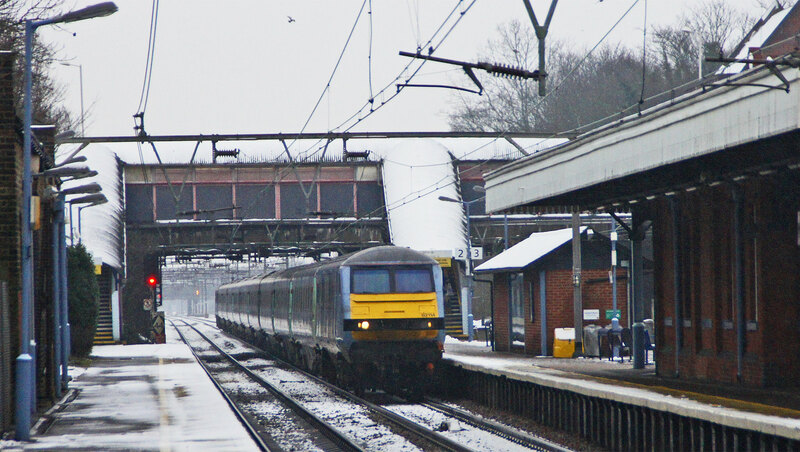 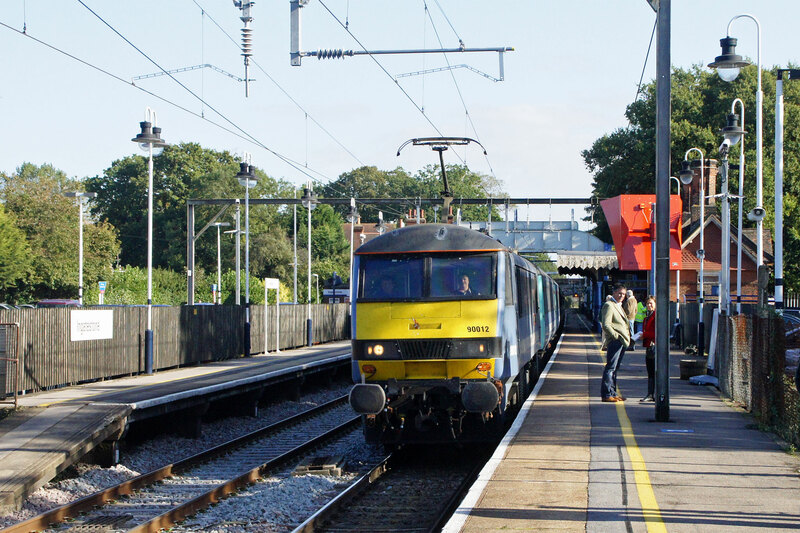 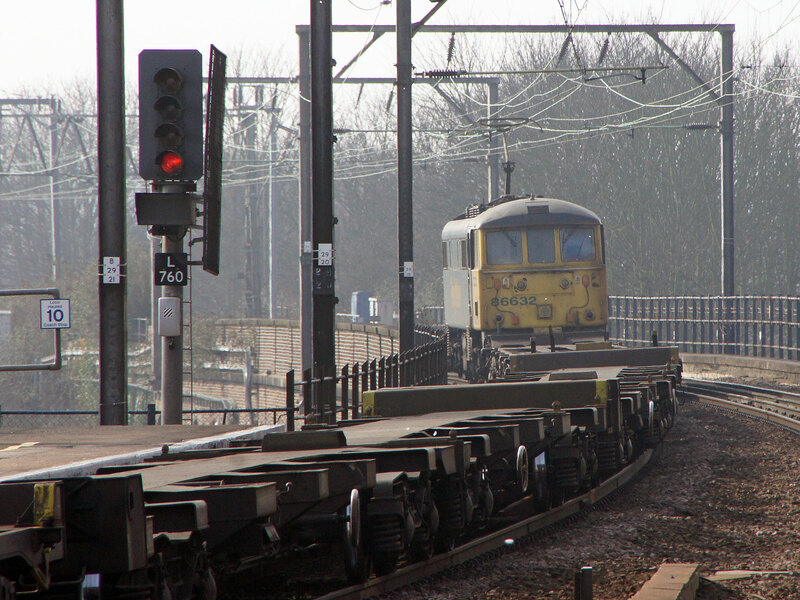 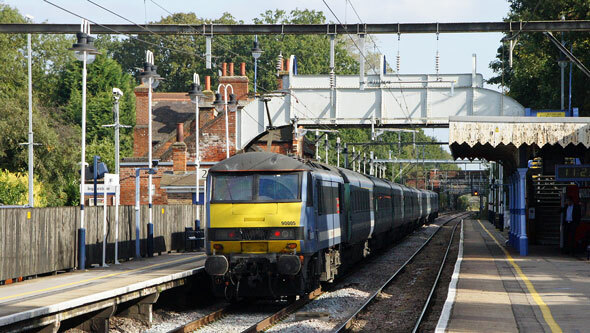 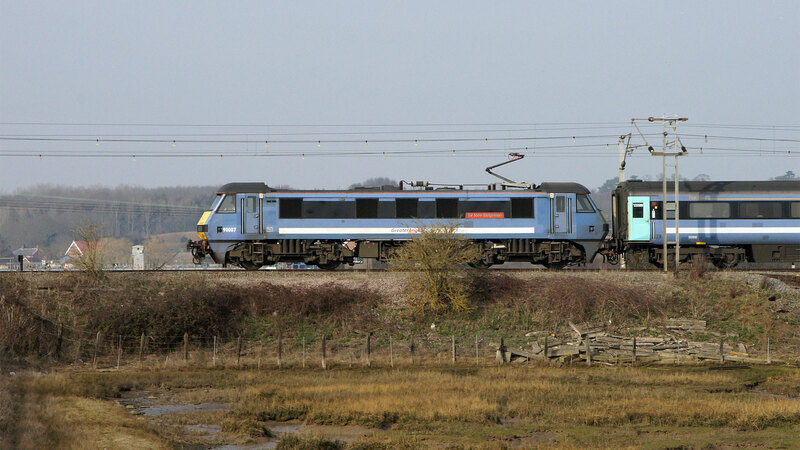 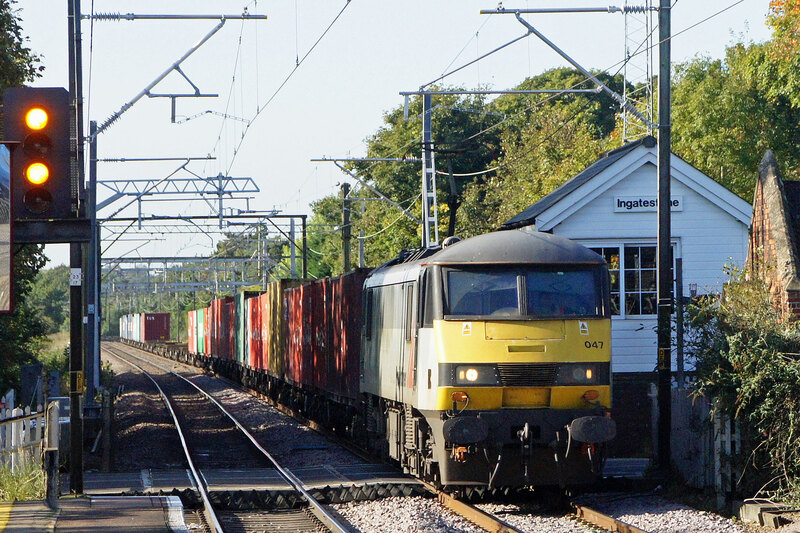 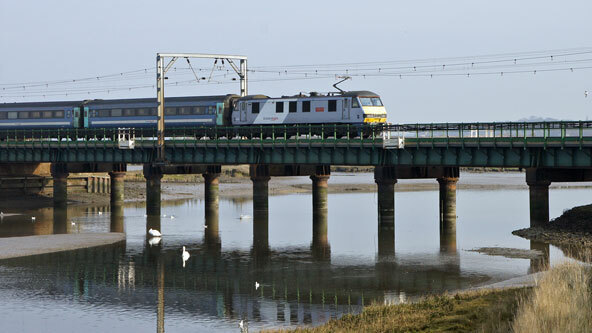 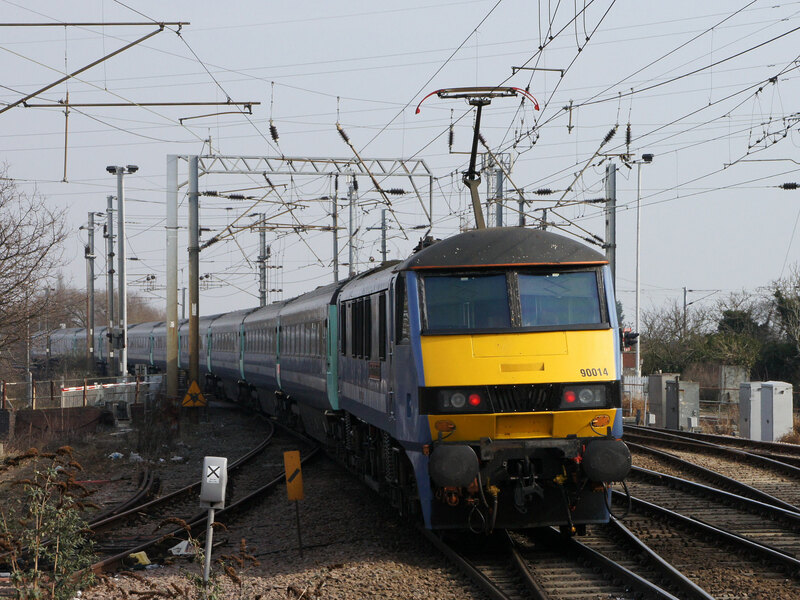 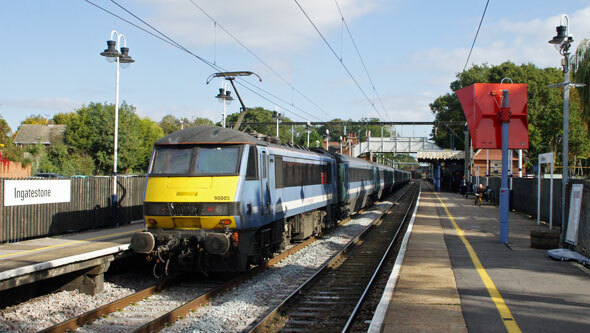 Images of other TOCs within the Greater Anglia area are also shown. 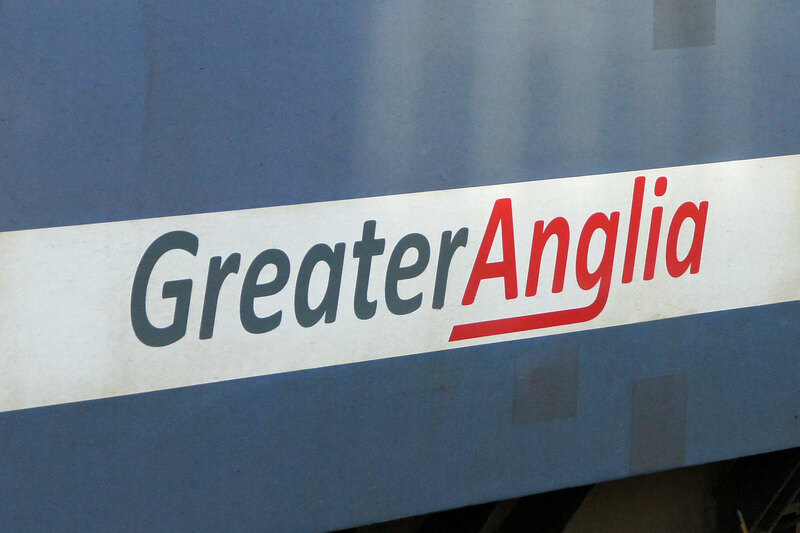 Greater Anglia Railways Page 1: Locomotives - this page! 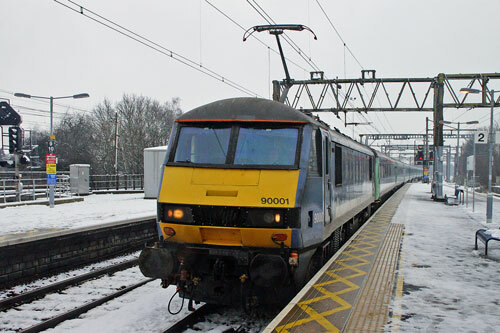 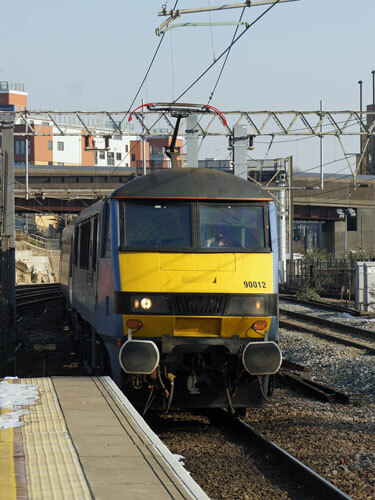 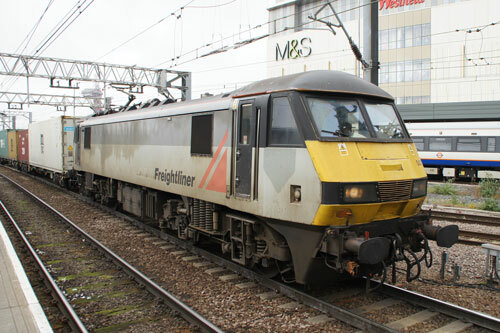 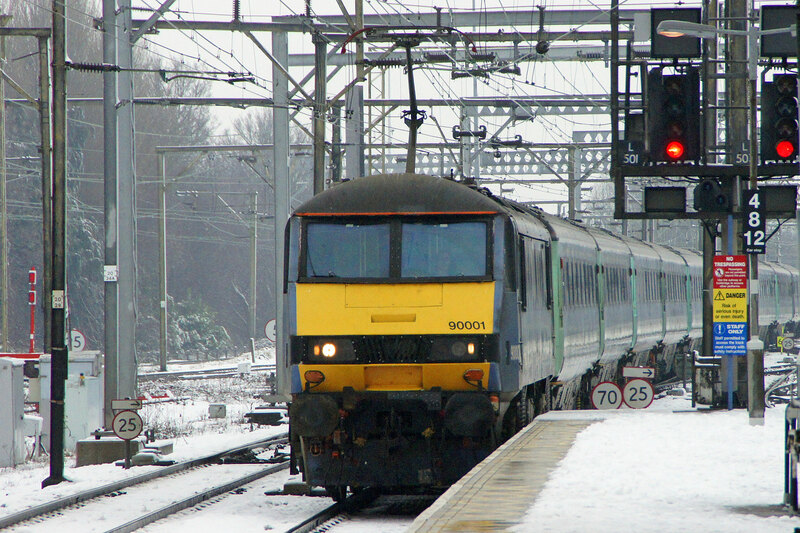 The British Rail Class 90 electric locomotives were built by BREL at Crewe from 1987-1990. 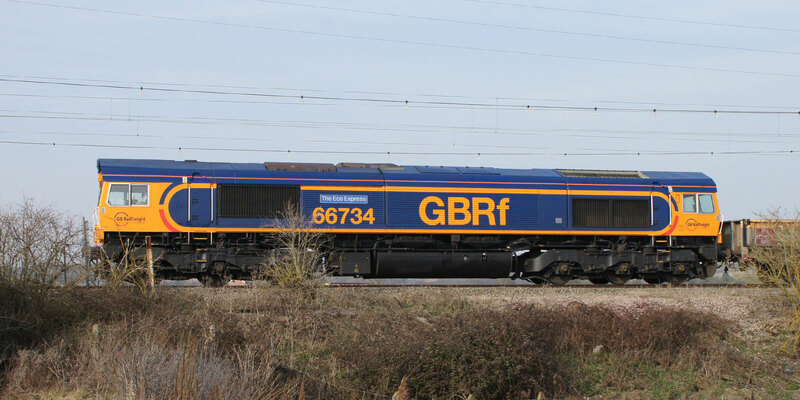 Each locomotive weighs 84.5 tonnes and has a top speed of 110 mph (180 km/h). 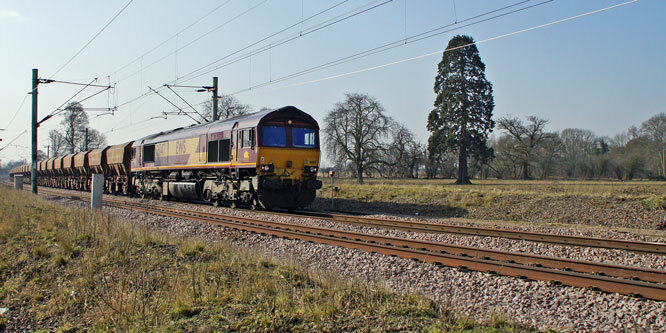 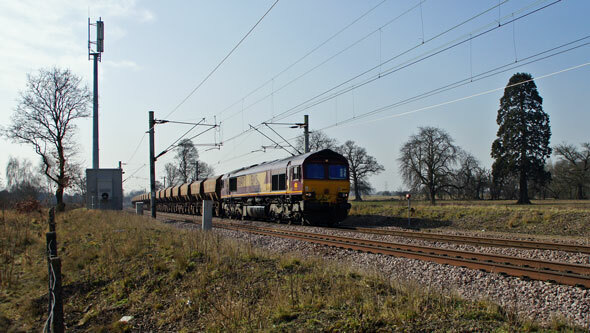 They operate from 25 kV AC overhead lines and produce 5,000 bhp (3,700 kW). 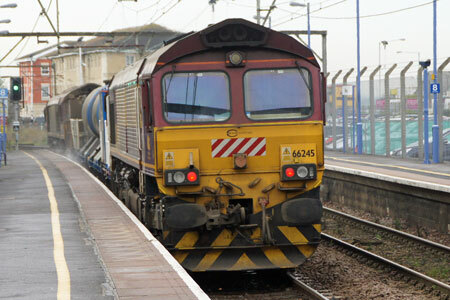 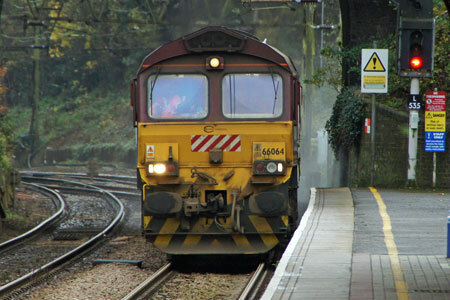 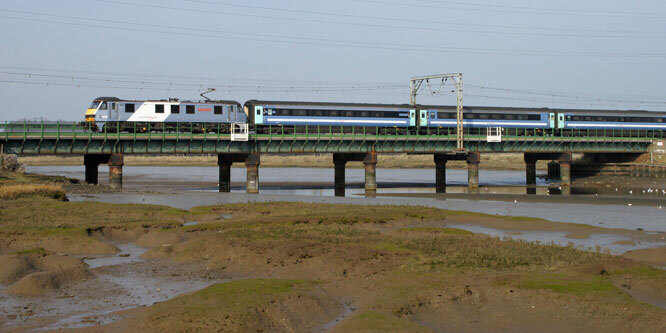 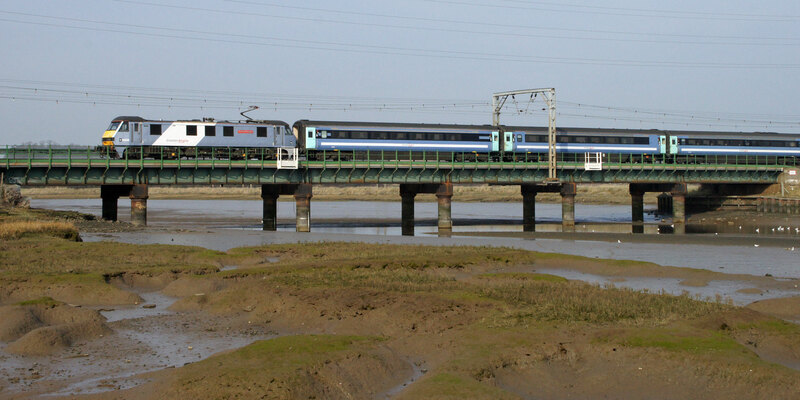 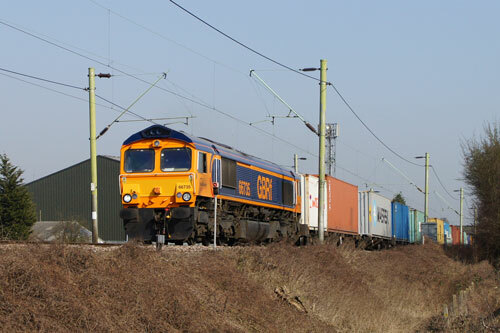 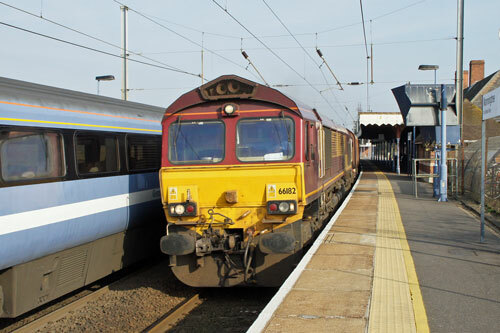 The class is employed on both express passenger services and heavy freight trains. 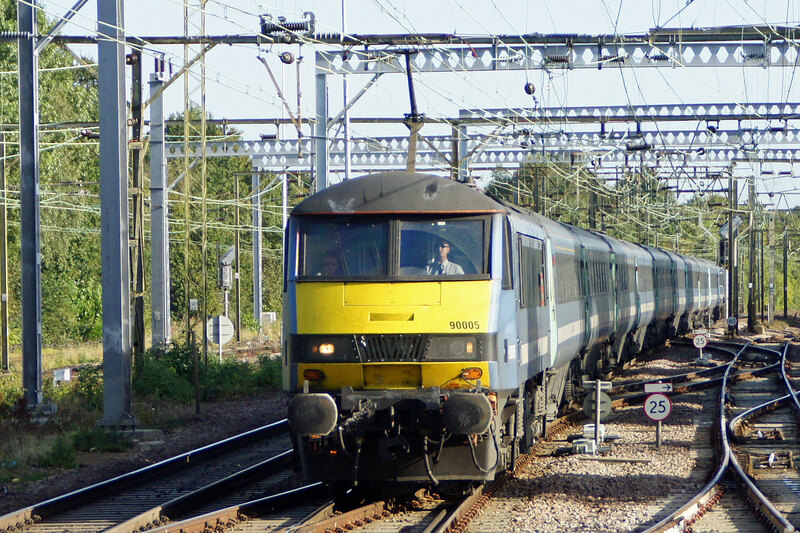 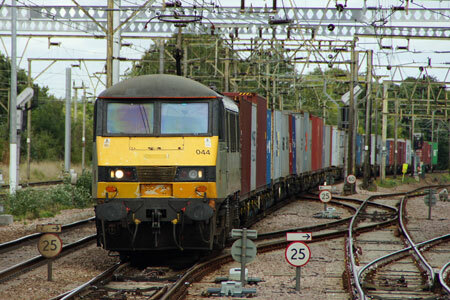 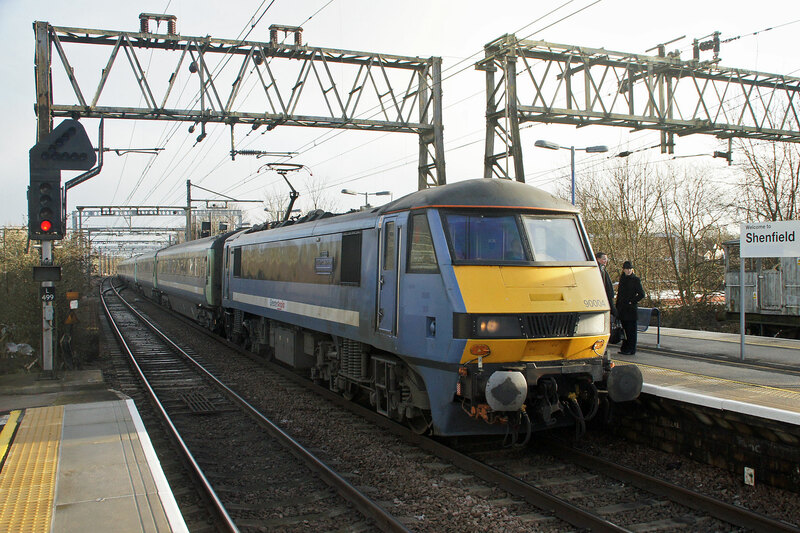 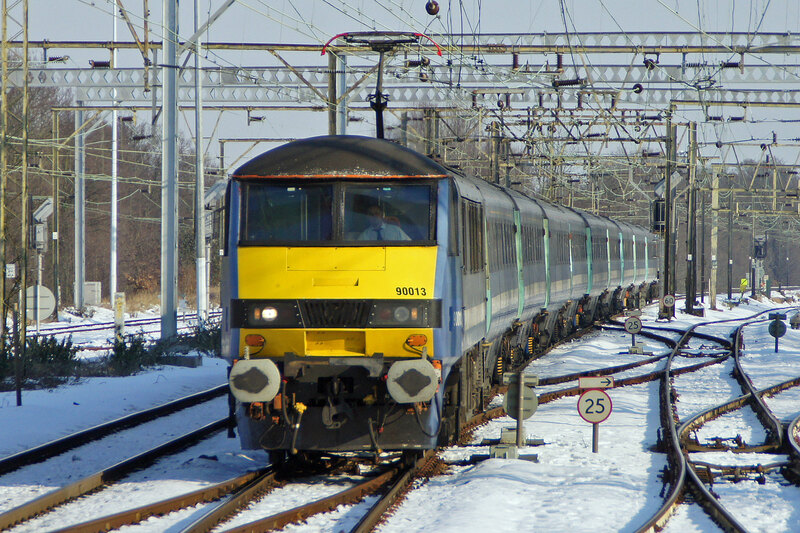 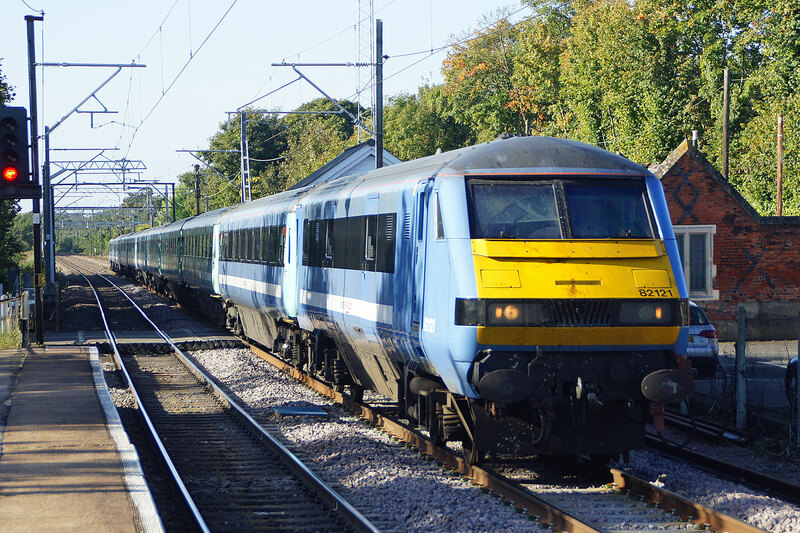 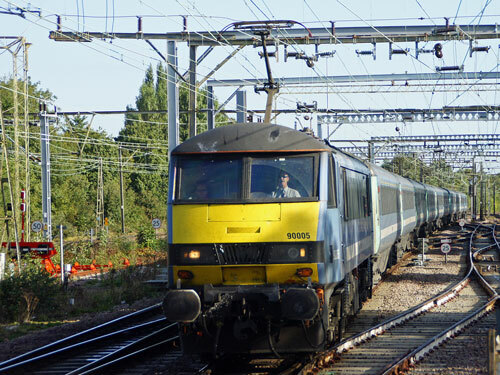 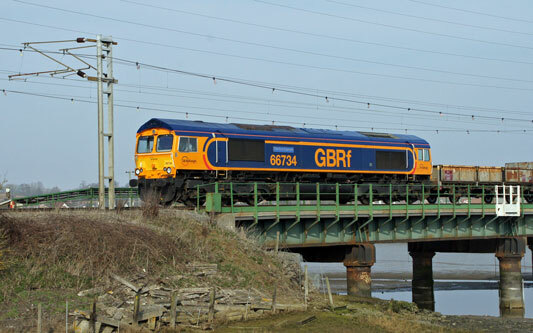 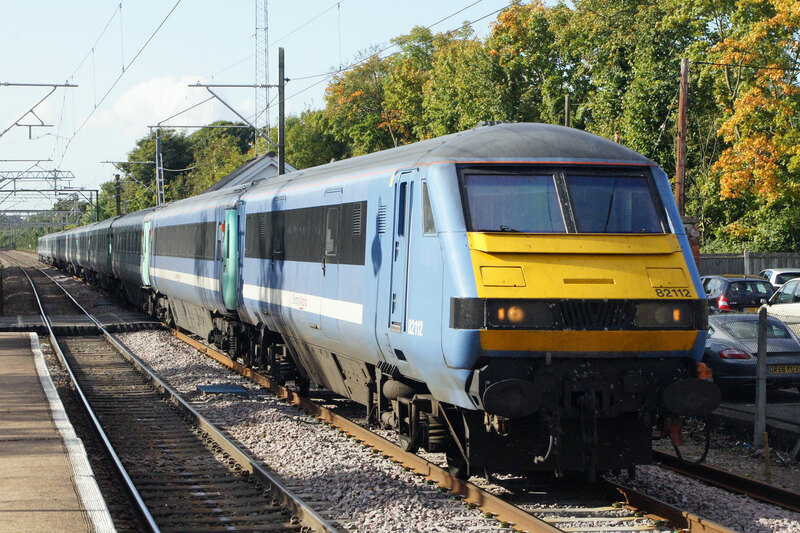 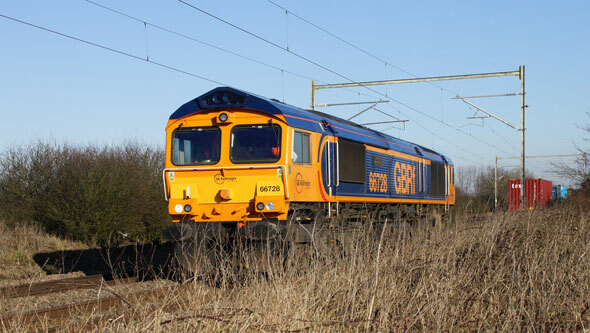 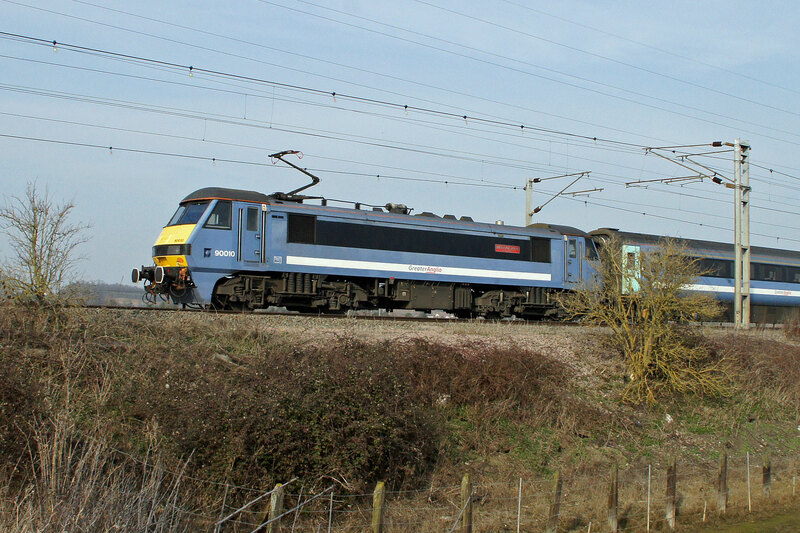 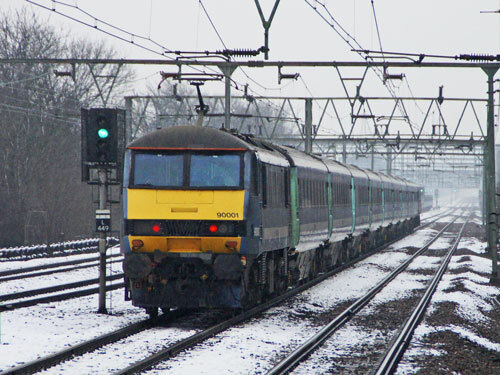 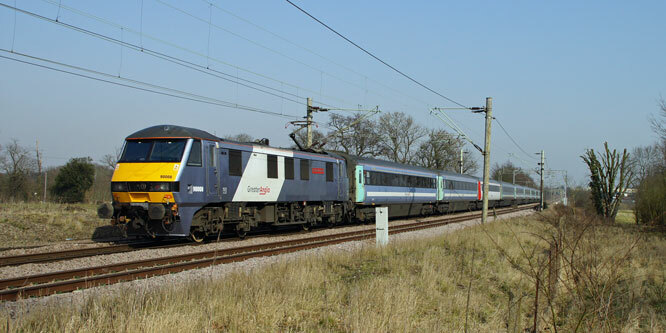 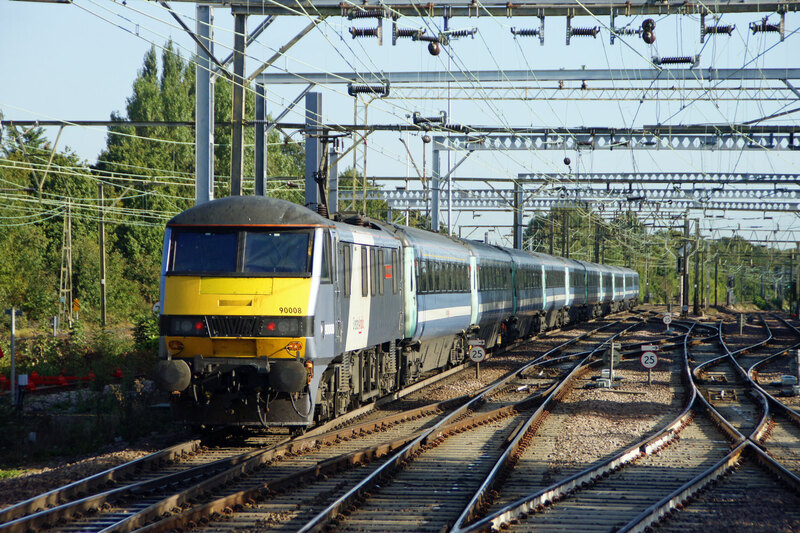 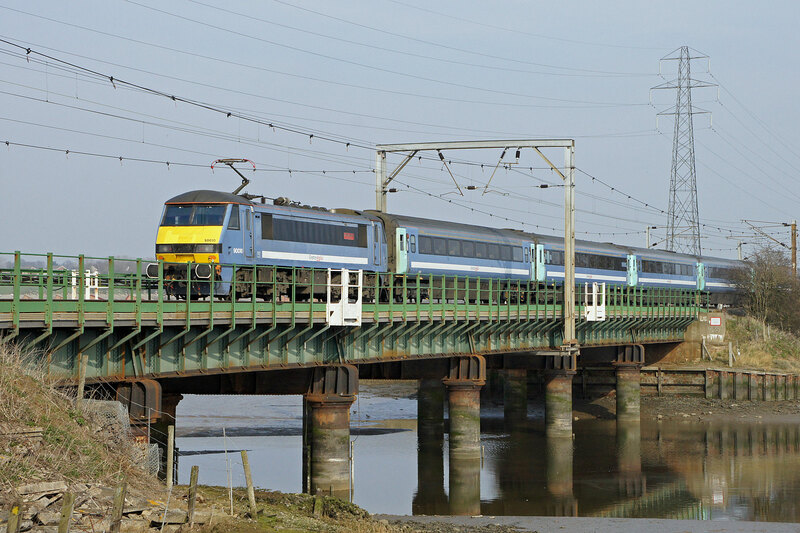 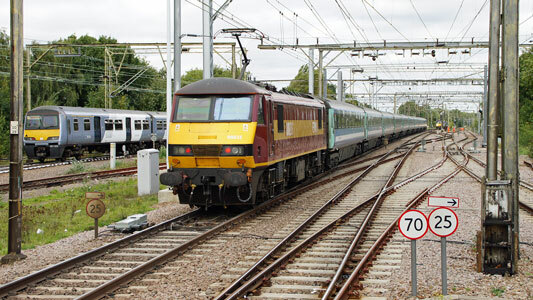 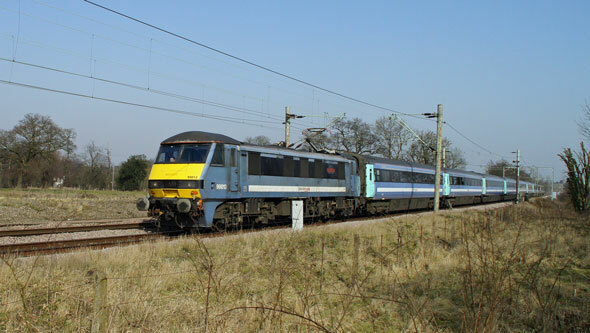 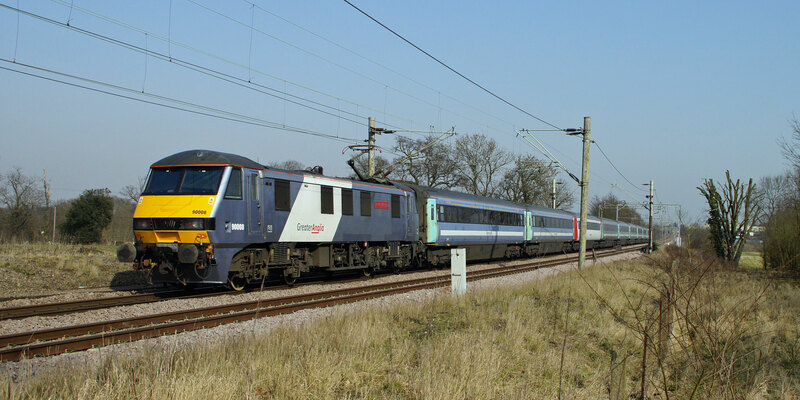 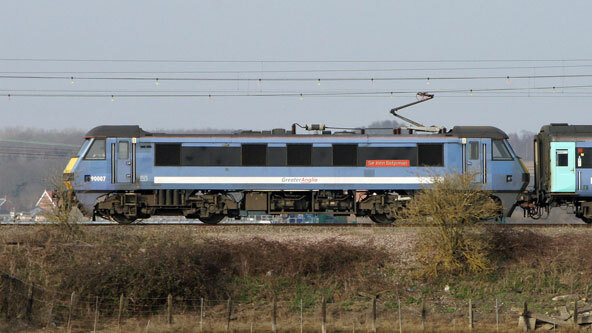 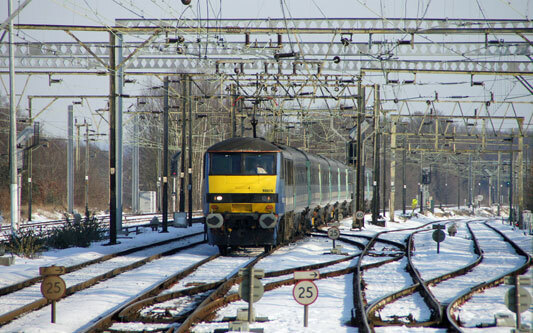 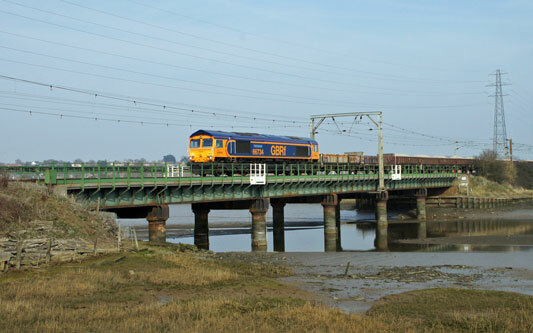 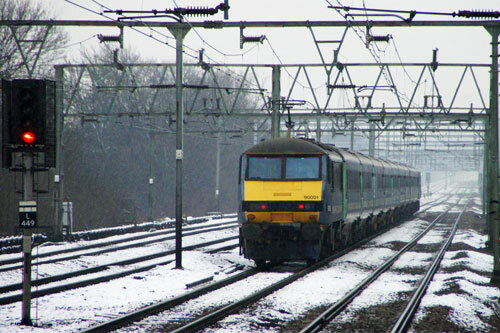 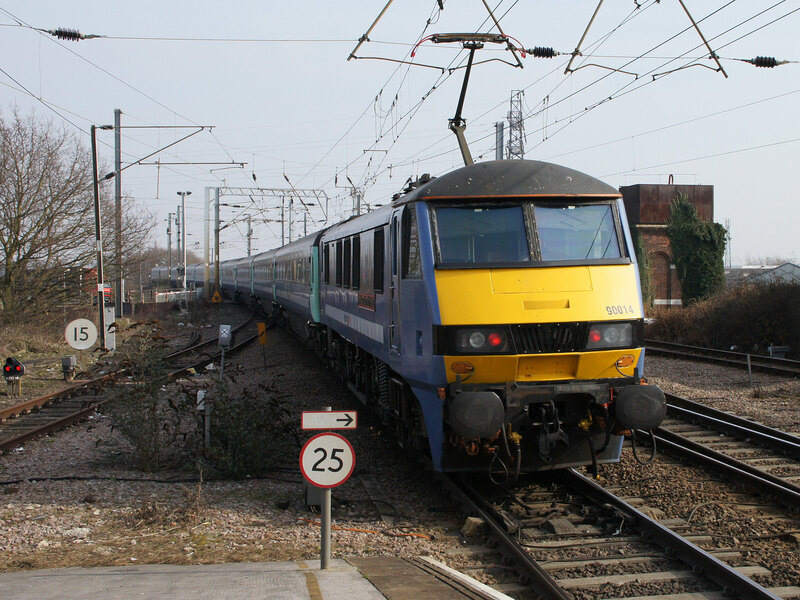 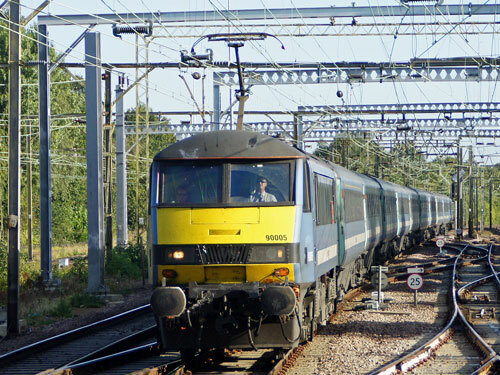 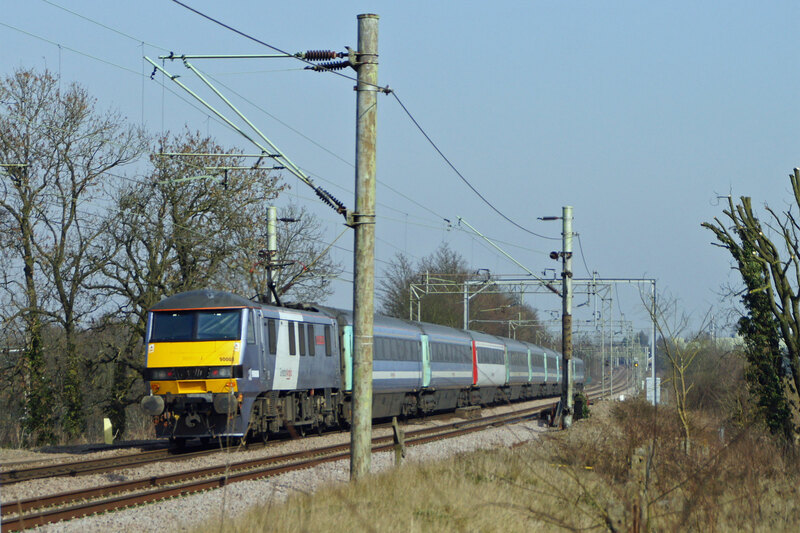 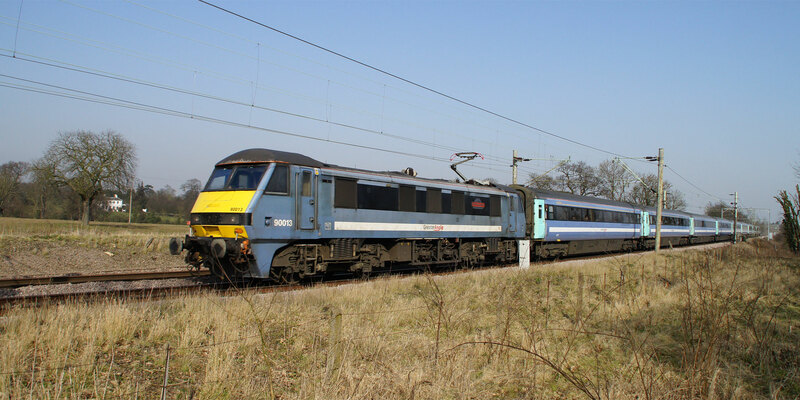 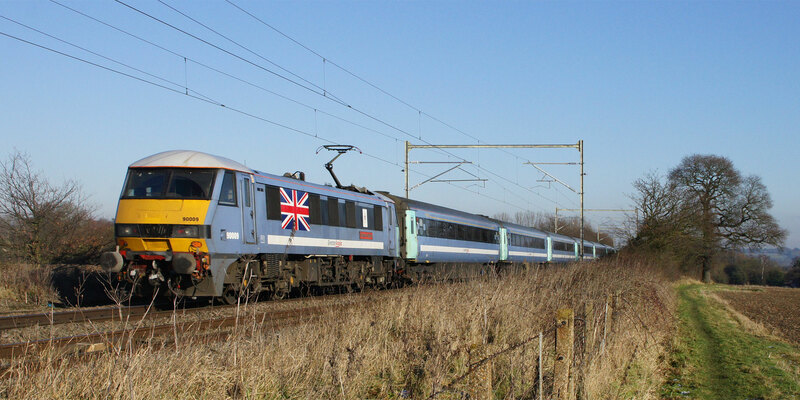 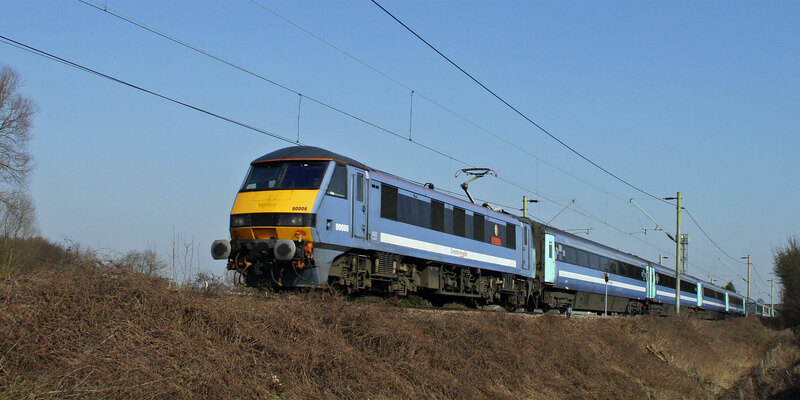 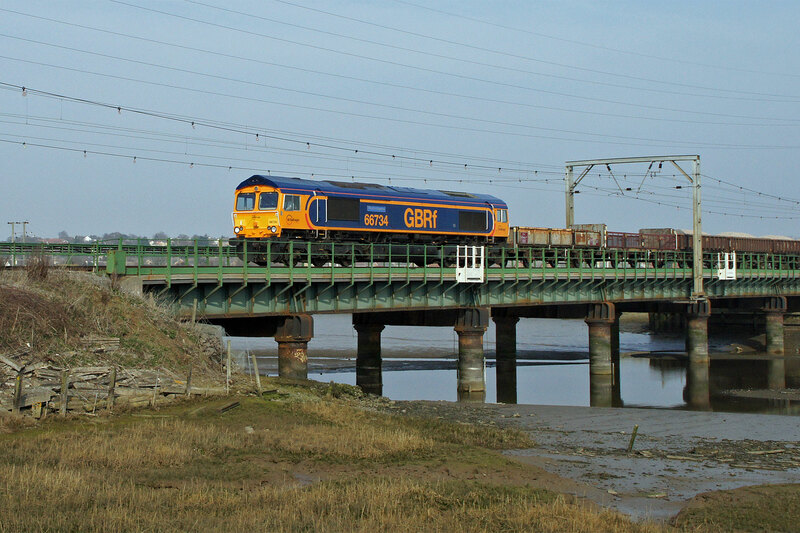 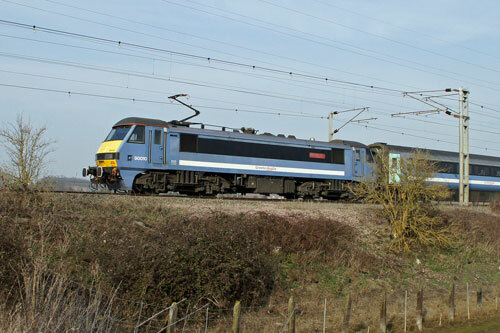 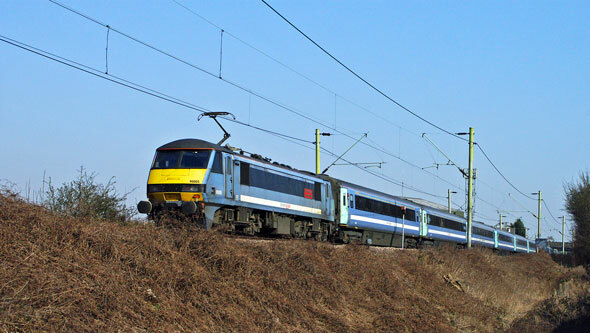 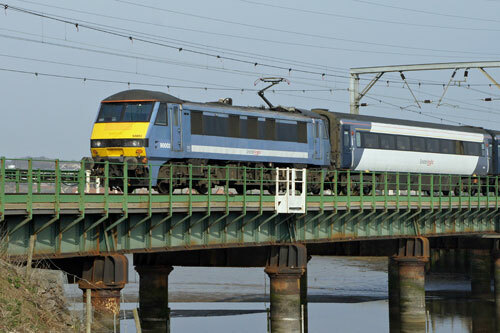 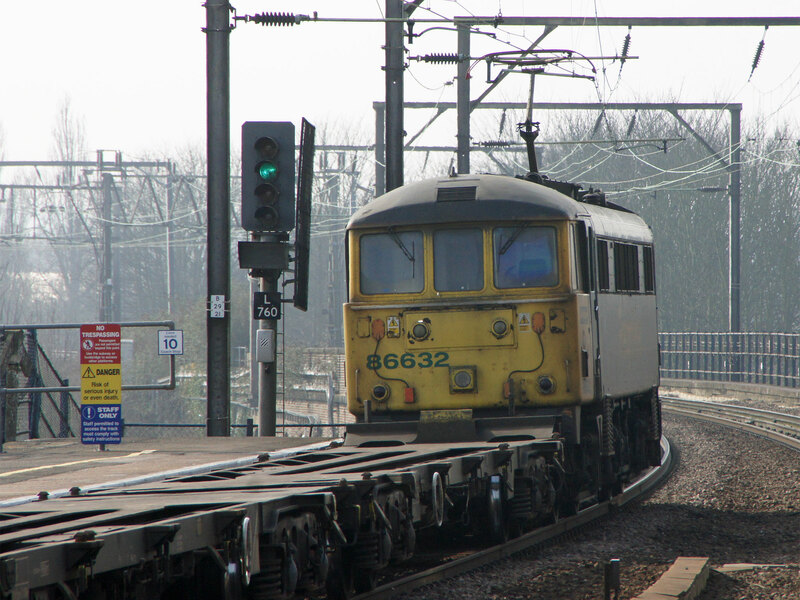 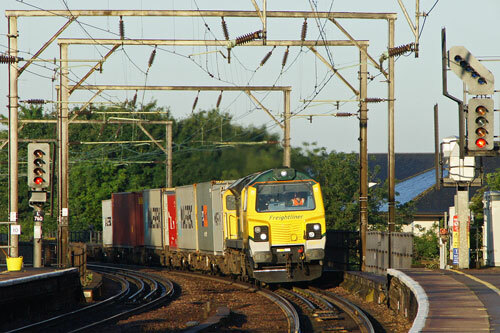 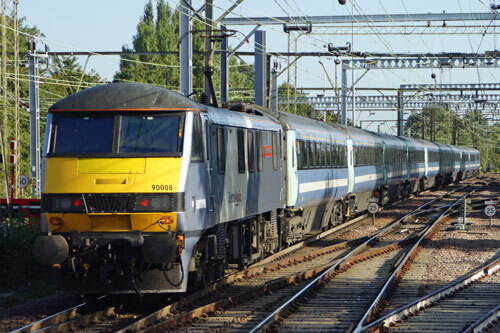 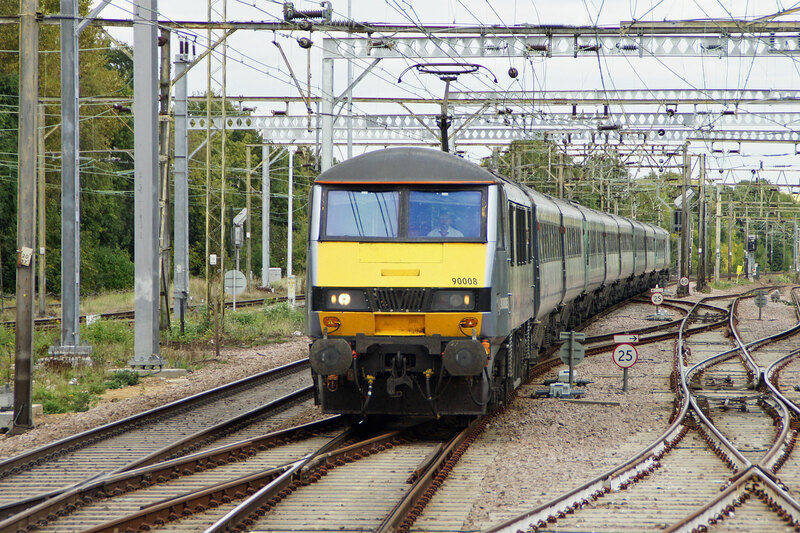 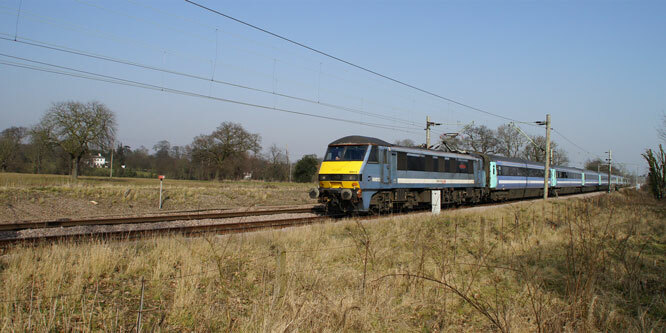 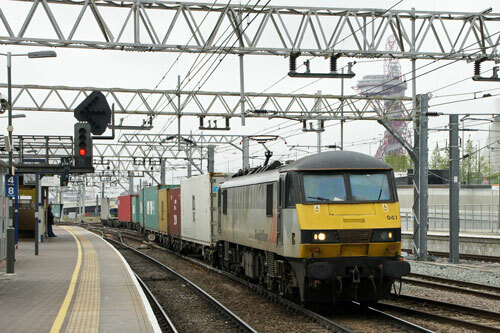 In early 2004 ONE (later National Express East Anglia - NXEA) needed a replacement for the ageing Class 86 locomotives on the Great Eastern Main Line. 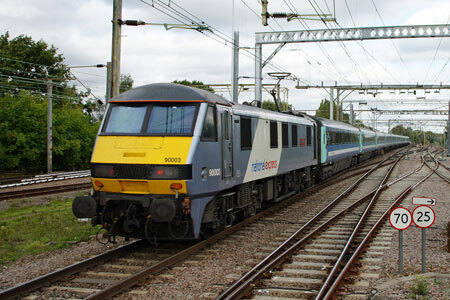 At the same time Virgin Trains was starting to retire its fleet of Class 90 locomotives as Class 390 units were introduced. 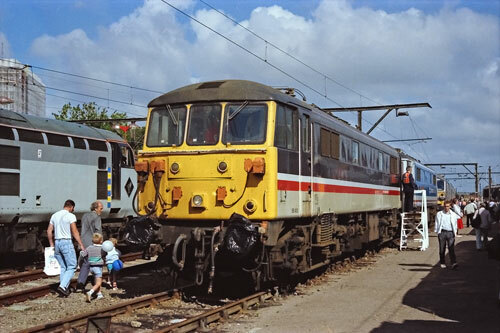 A deal was struck and progressively 90001-015 were delivered to Norwich Crown Point to replace the Class 86s, but their reliability wasn't good and the last few Class 86s were kept in service, and Class 47s hired from Cotswold Rail were sometimes used also. 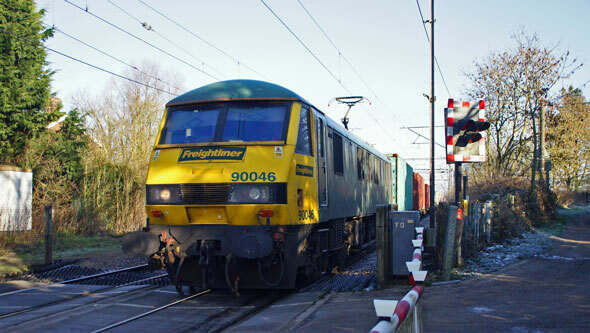 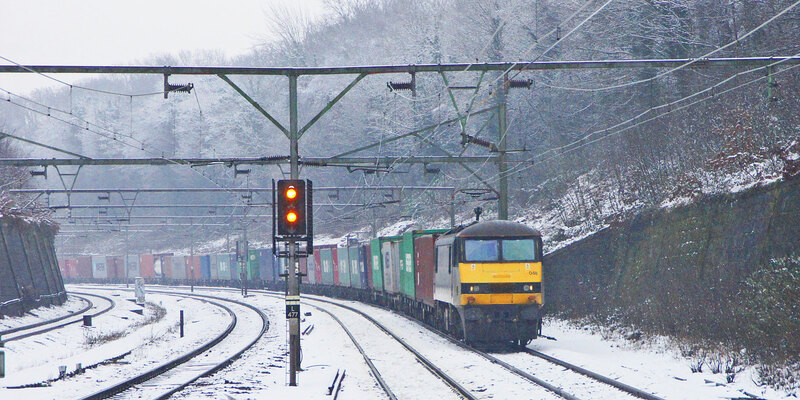 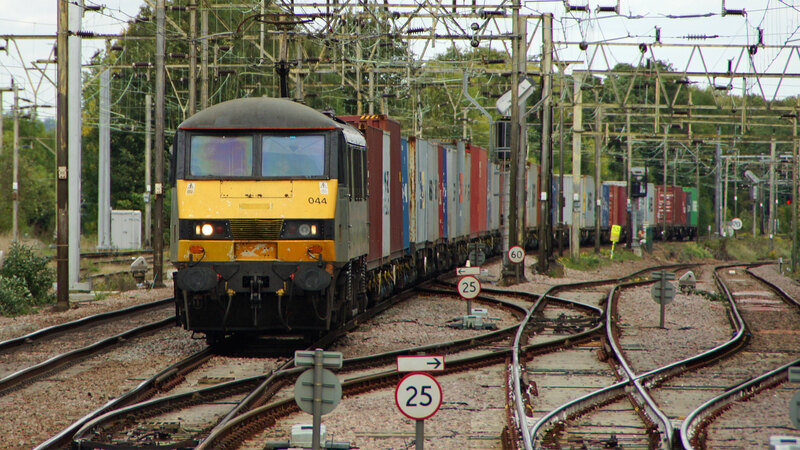 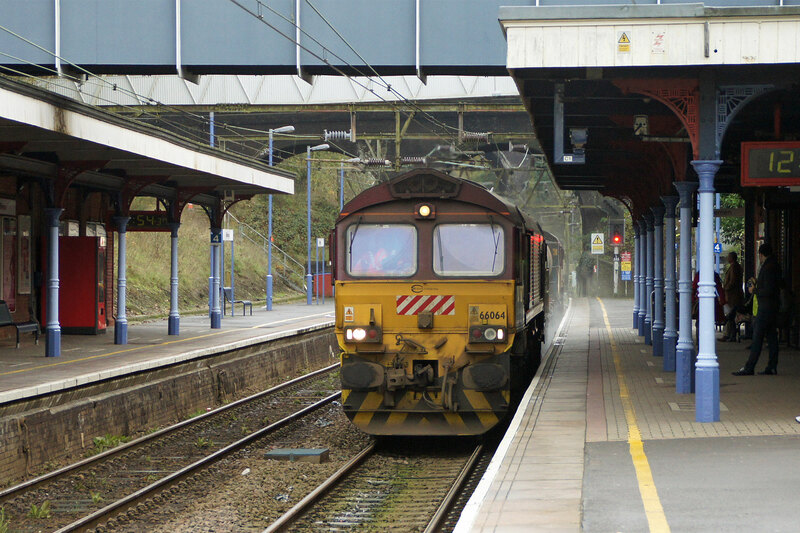 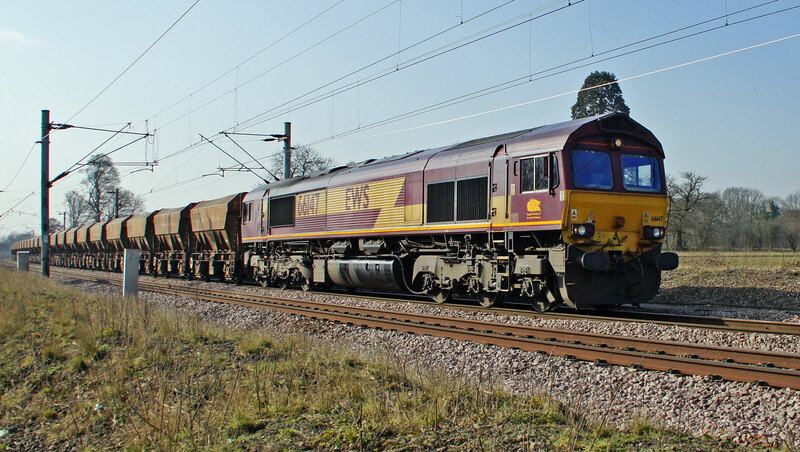 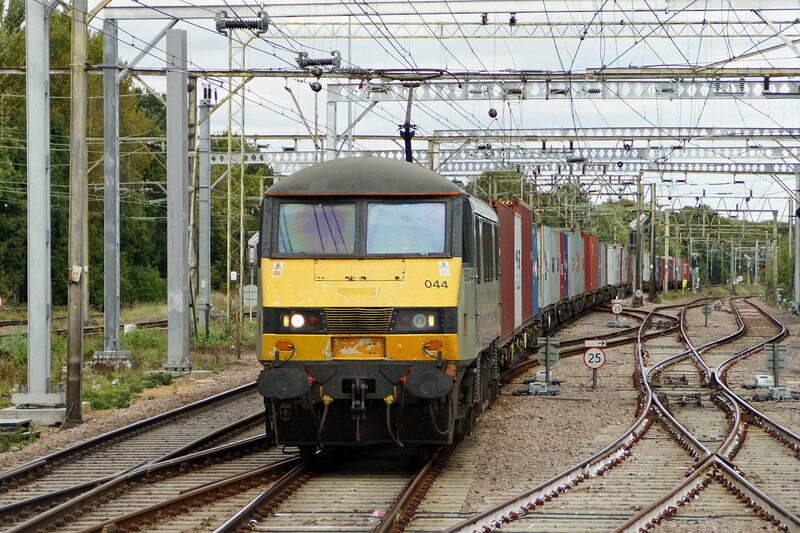 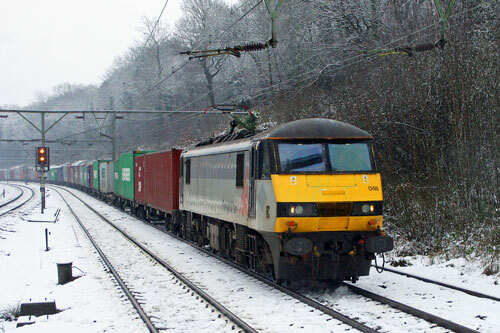 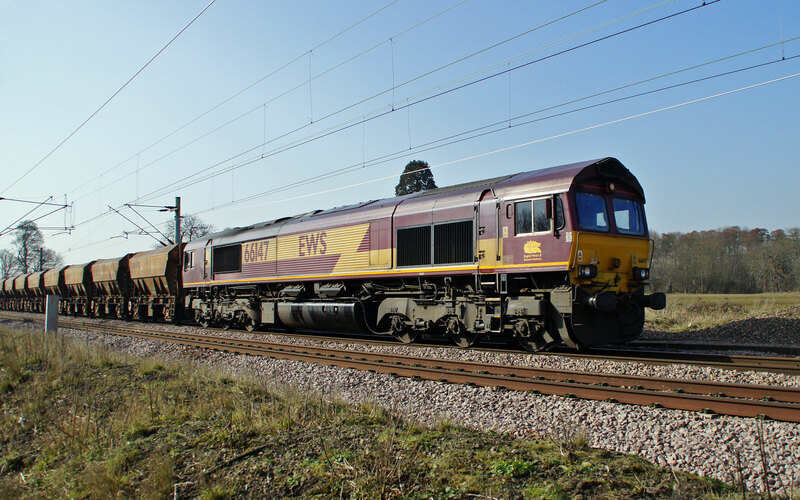 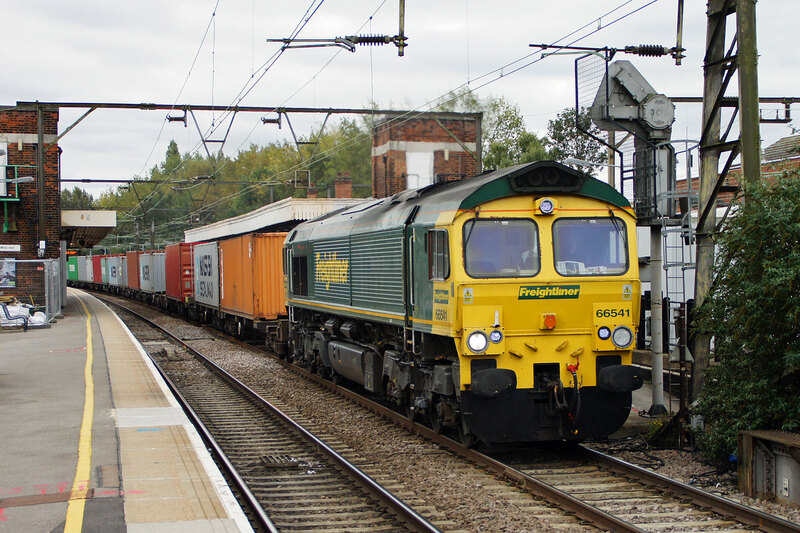 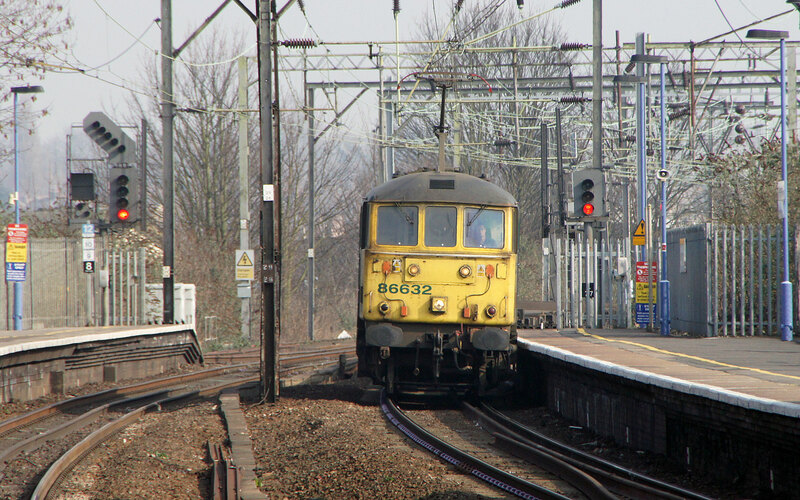 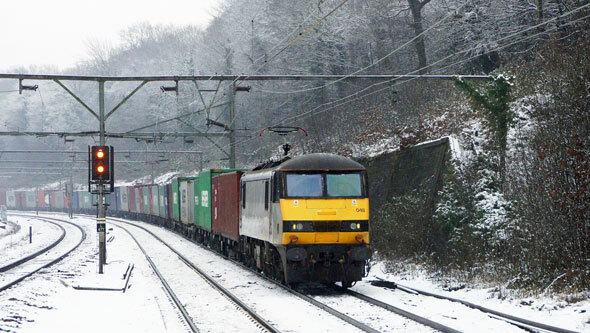 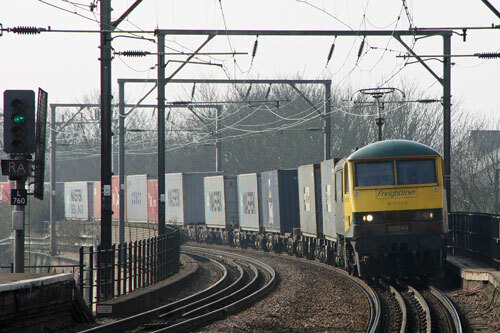 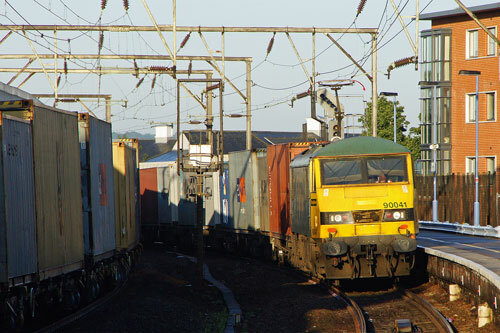 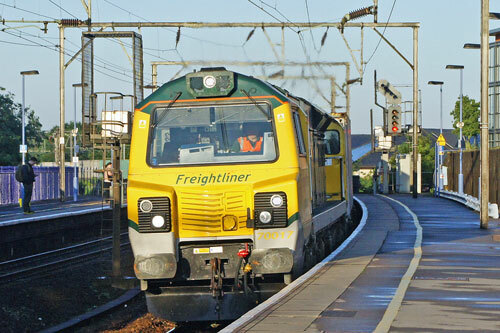 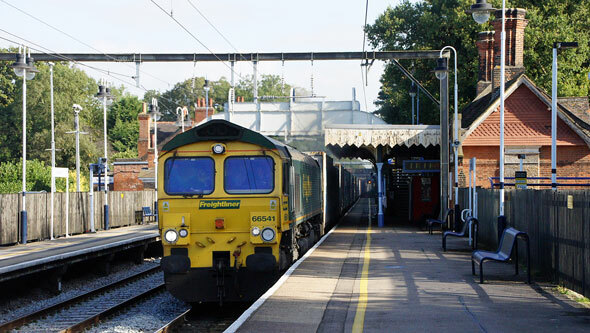 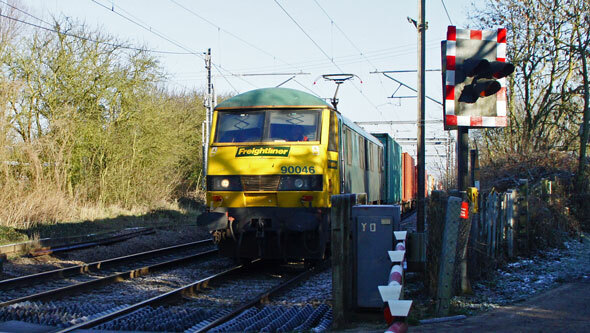 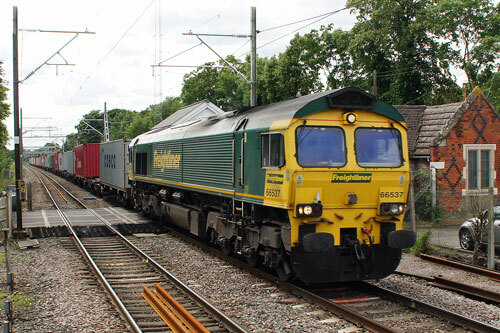 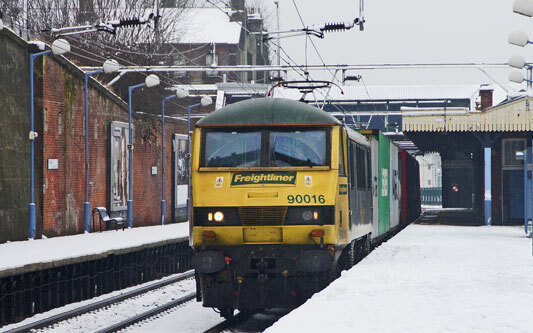 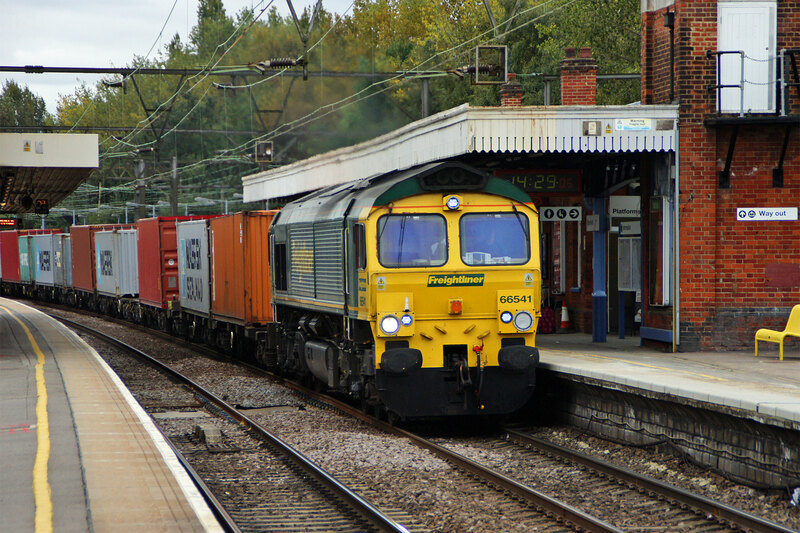 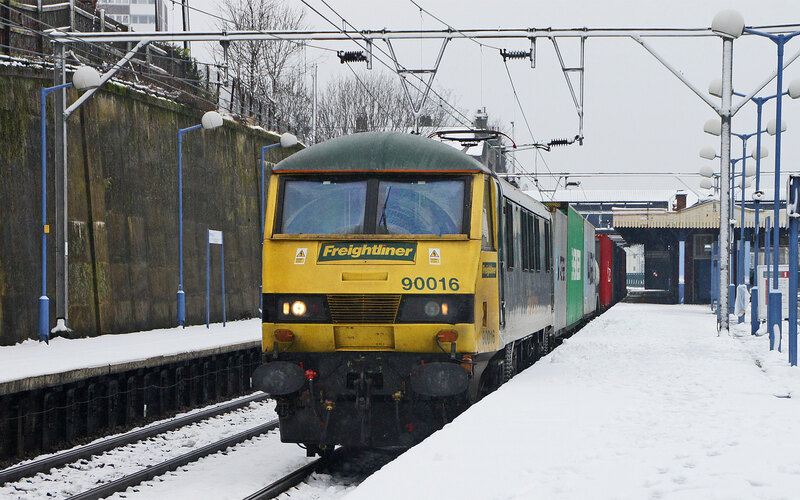 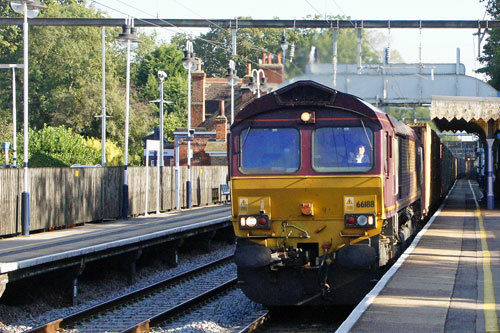 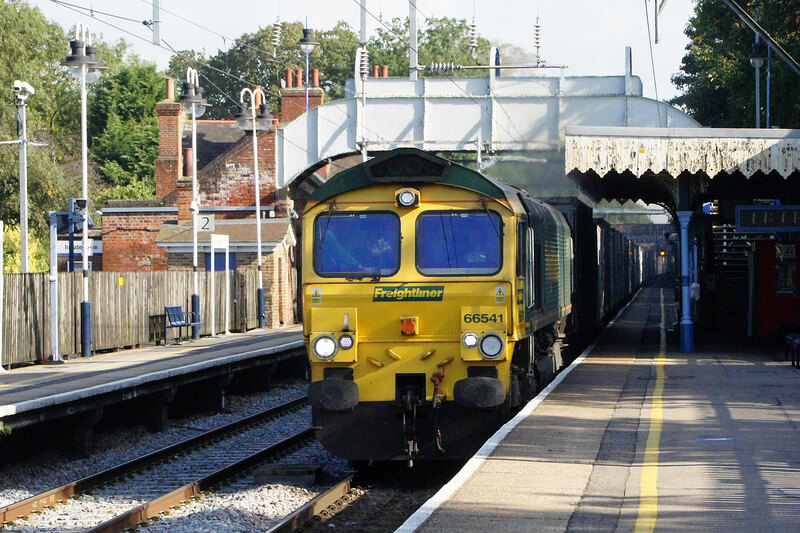 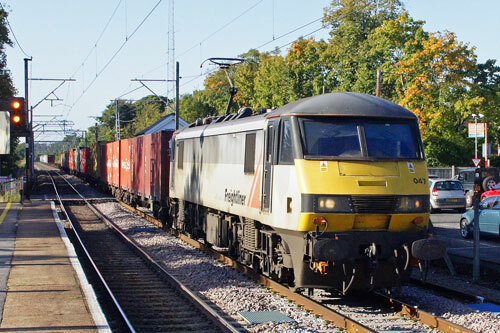 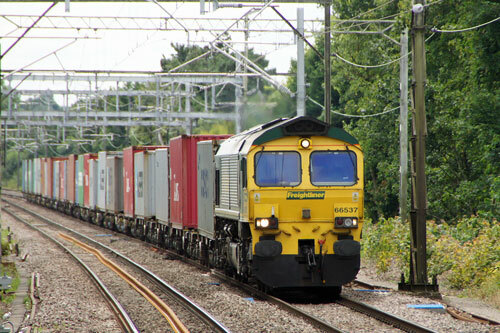 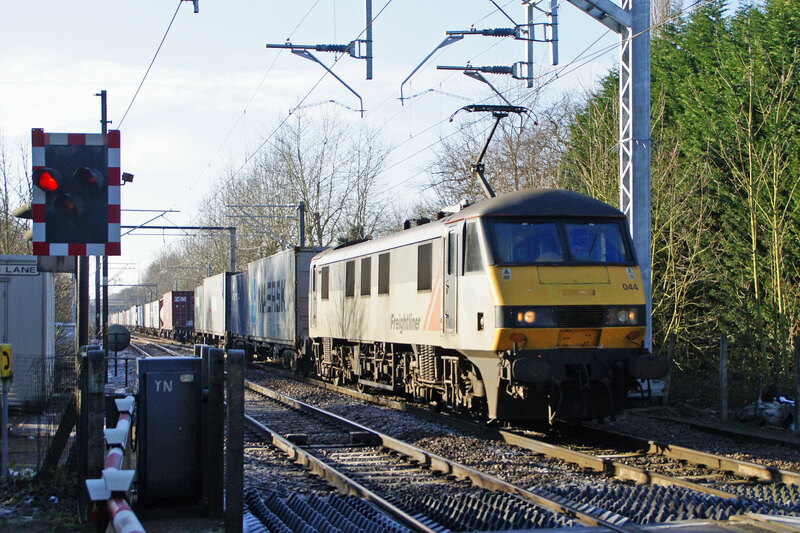 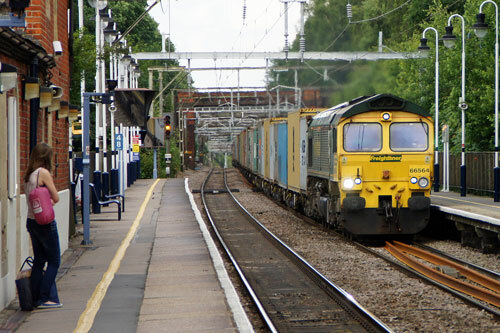 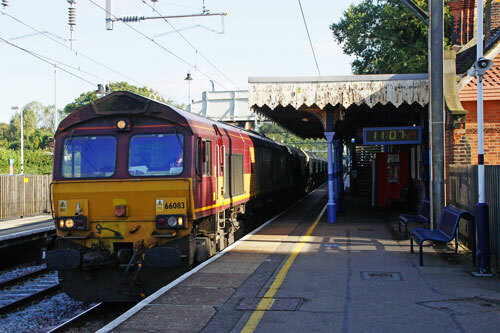 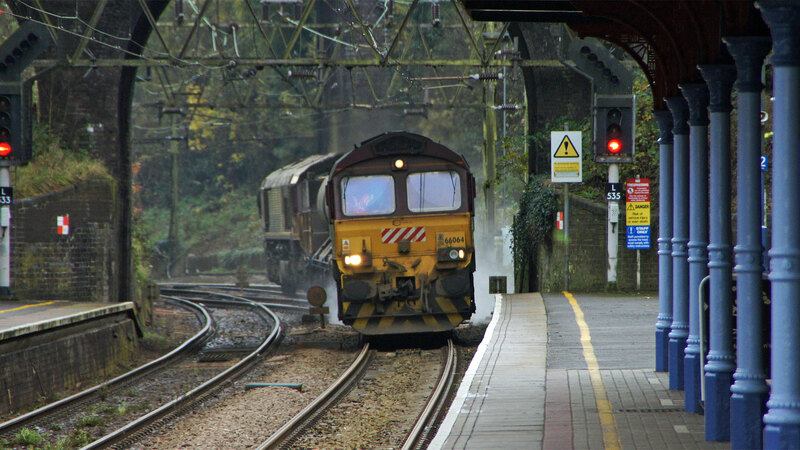 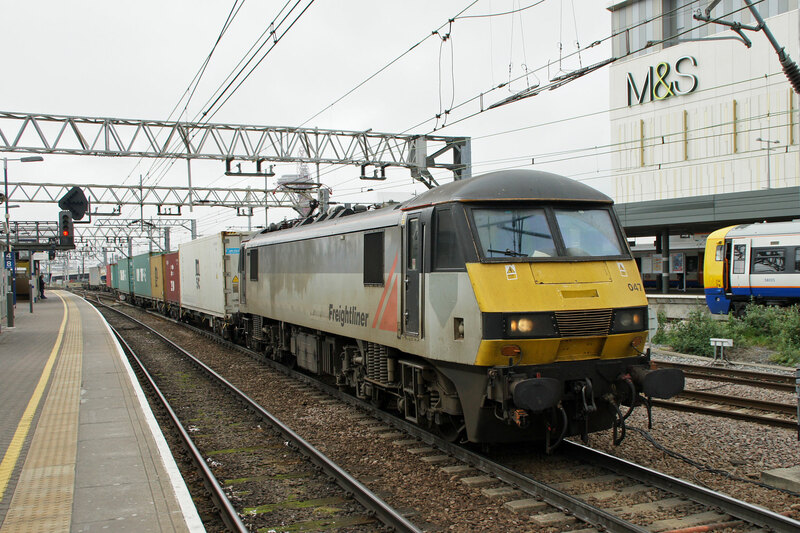 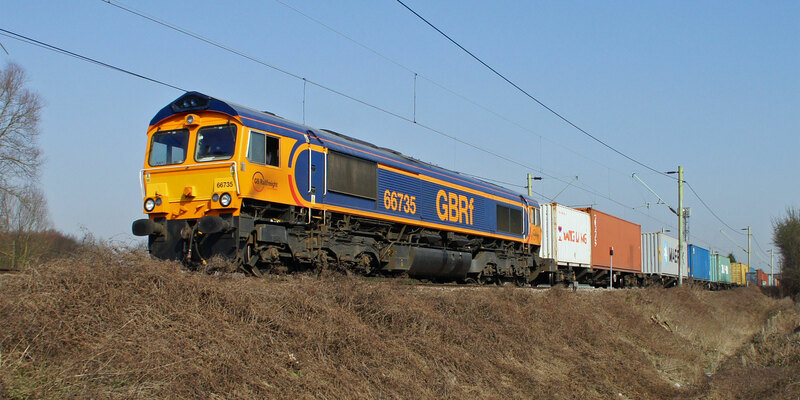 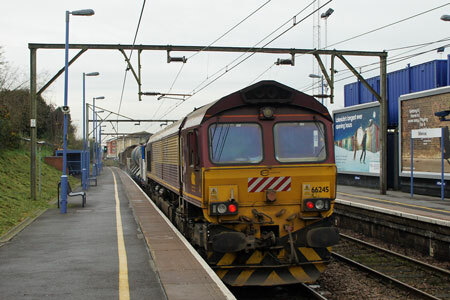 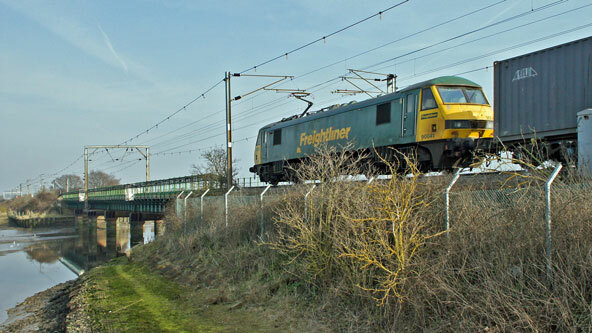 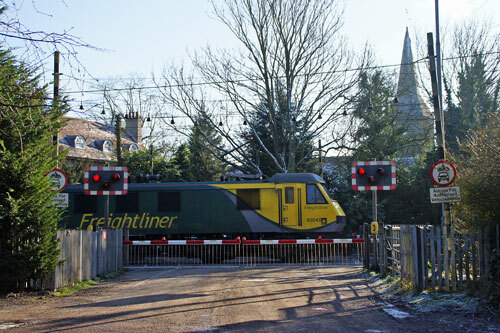 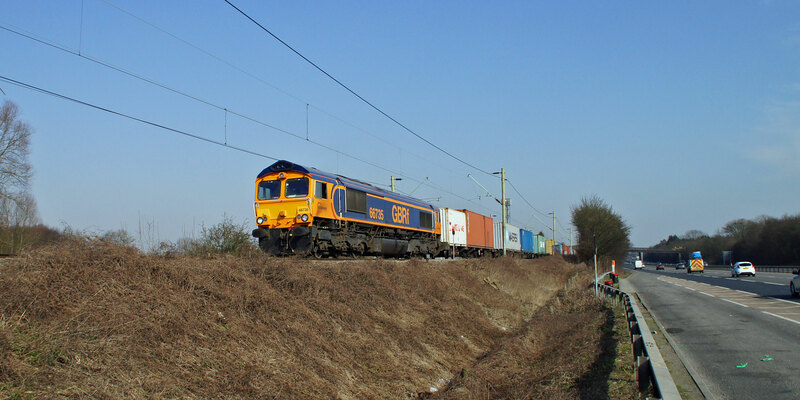 'one' then borrowed Class 90s from EWS and Freightliner to retire the remaining Class 86s. 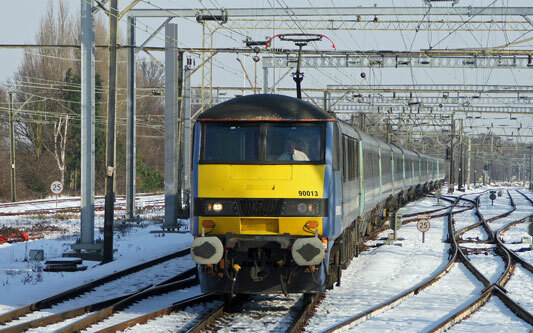 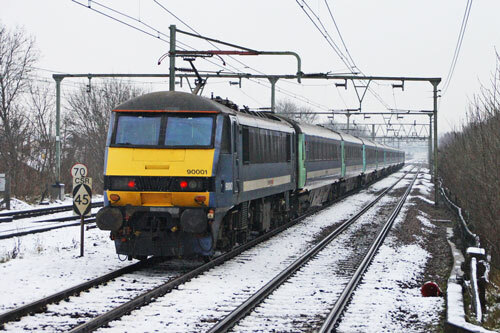 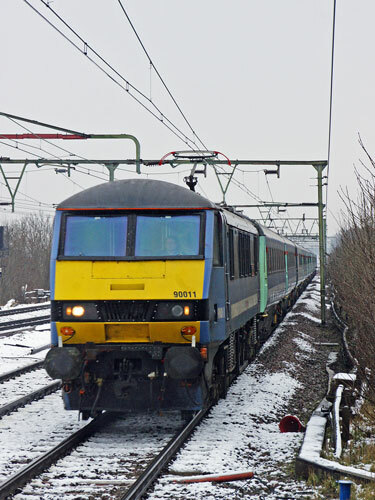 The Class 90s' reliability improved and the borrowed locos were returned to their owners. 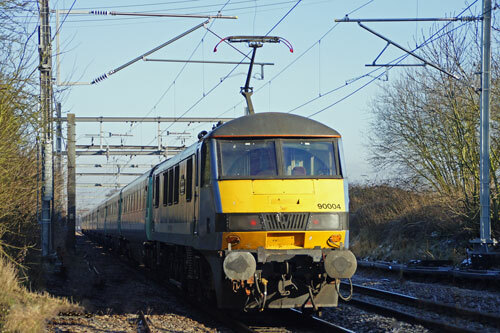 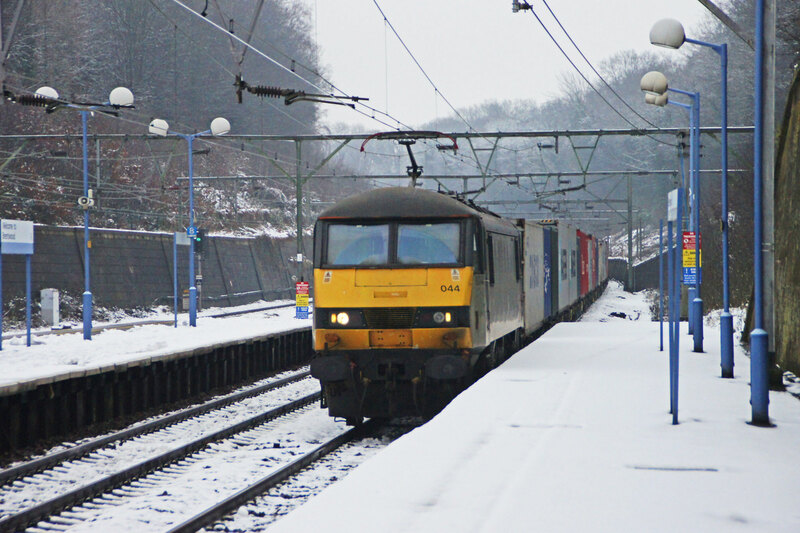 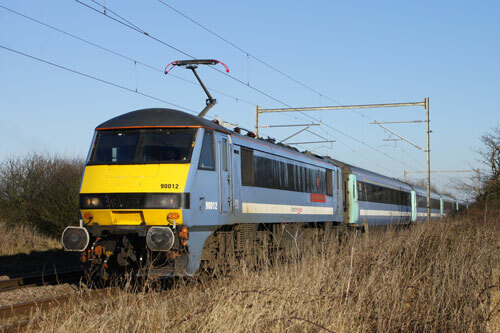 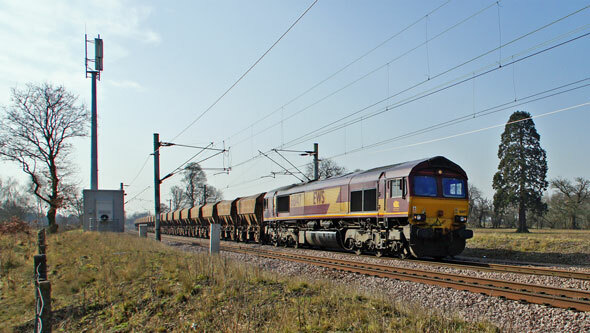 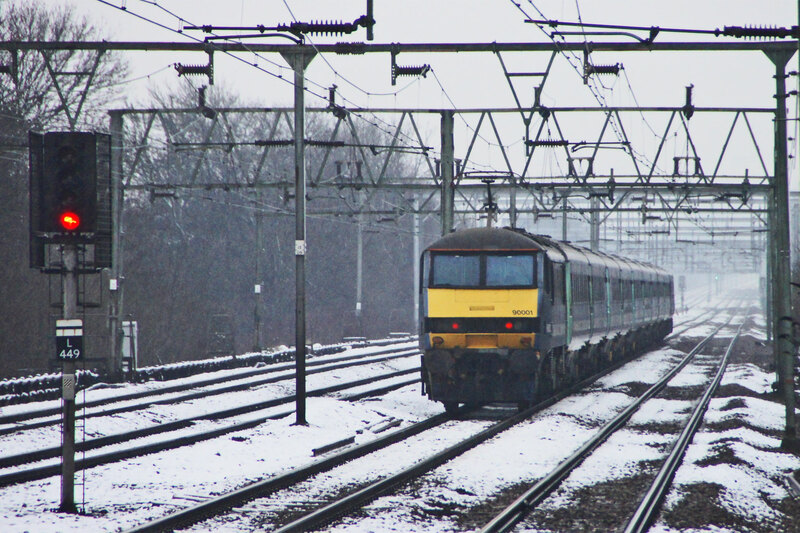 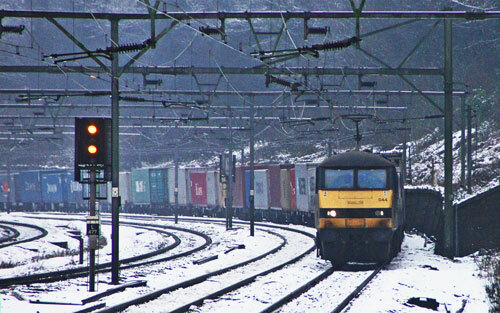 Through 2006 and 2007 reliability has improved greatly: in 2007 the whole fleet won the 'Silver Spanner' from Modern Railways for the most improved main line fleet reliability in the UK. 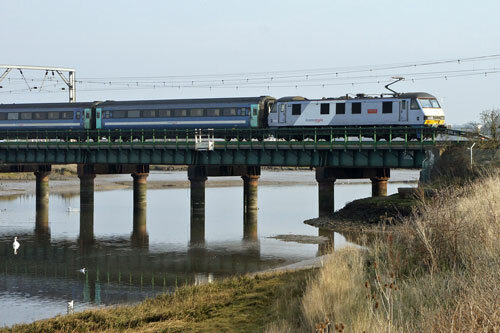 NXEA passed their franchise onto Abellio's Greater Anglia in February 2012, who now operate the trains.